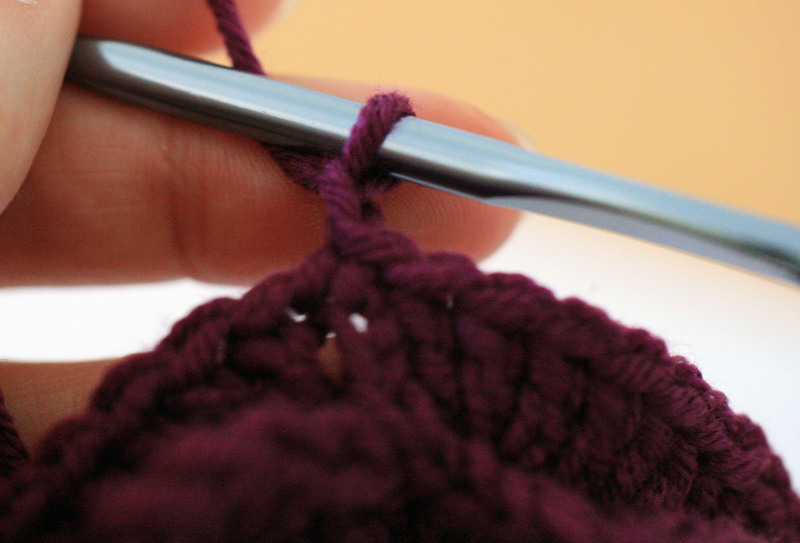 I have kept the words to a minimum as this is such a long post with all the images of each week. 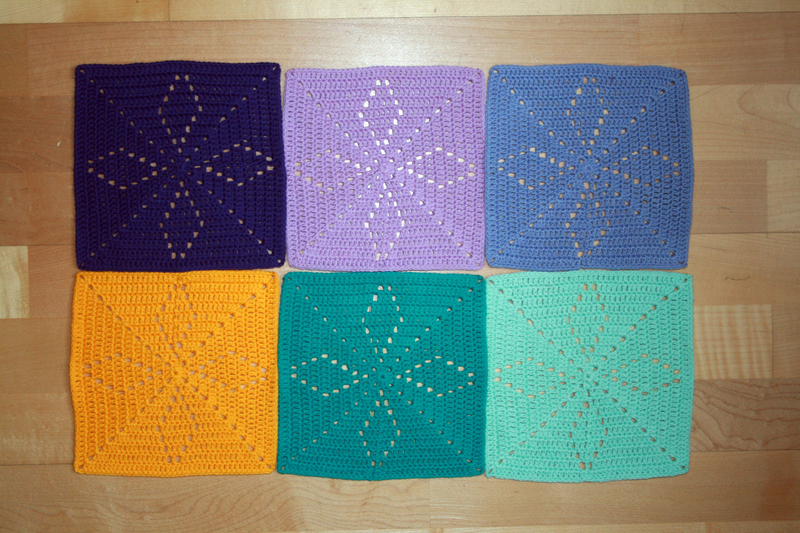 I did enjoy making this blanket even though the yarn and hook size were finer and smaller than I usually like to work with. 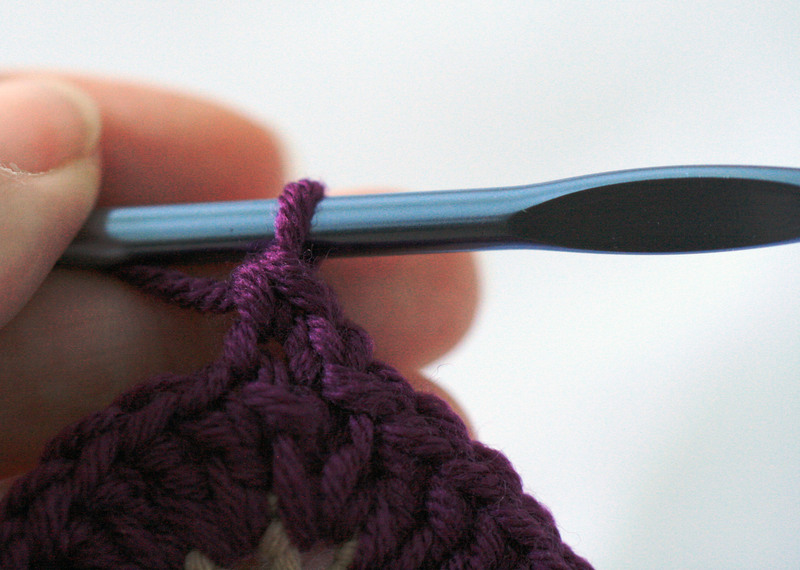 I find that smaller hooks are more stressfull on my wrist. 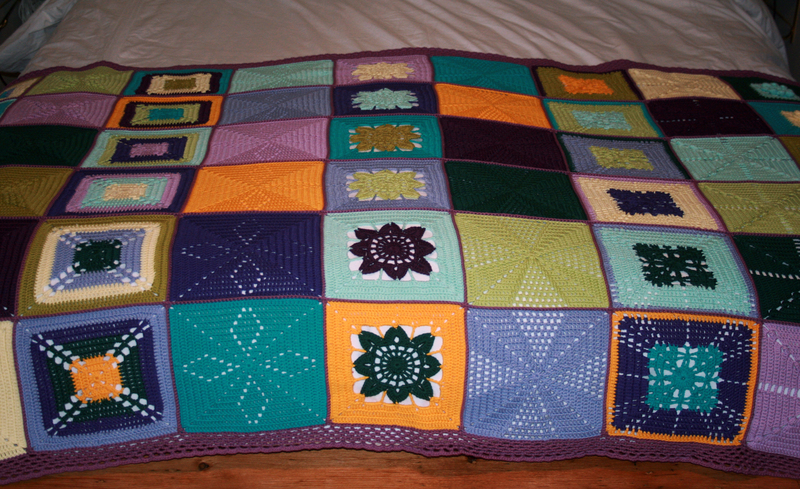 I made this for a very close friend and I am pleased to report that she was very happy with the finished blanket. There is something special for me in gifting a blanket, I think it’s because it’s a timeless item and is a reflection of our friendship. So here are the week by week images. 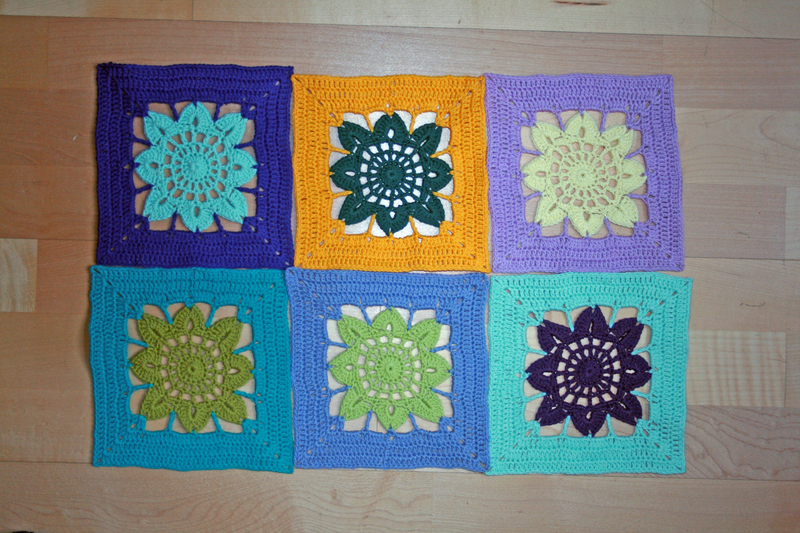 I did start with the intention of doing all the squares in single colours but just could not continue when I got to week 4, I thought the flowers were just crying out to be shown off. 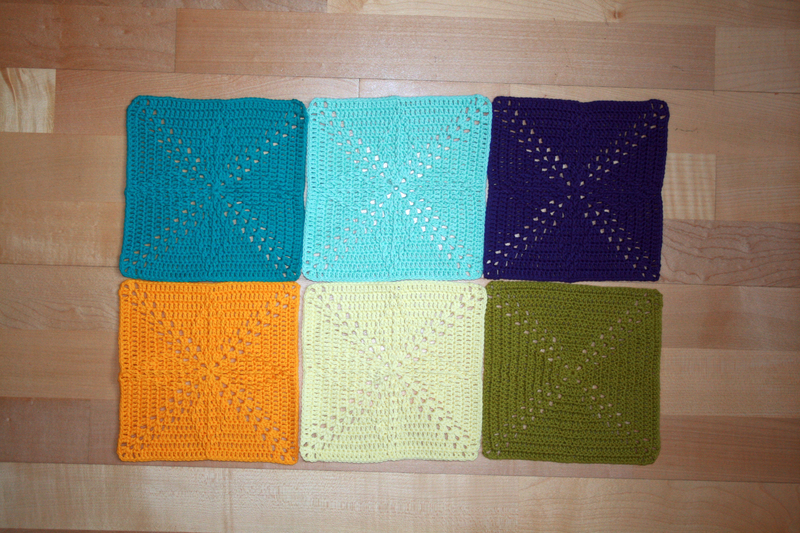 All squares joined and finished with a simple edging. 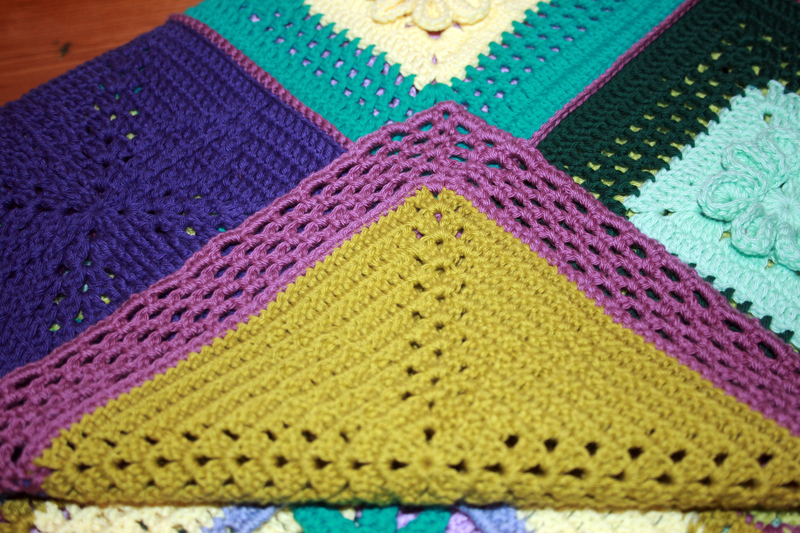 My grateful thanks to A Creative Being for running this CAL, I commend you for the way you delivered the patterns, so easy to follow and keeping the printing to a minimum. 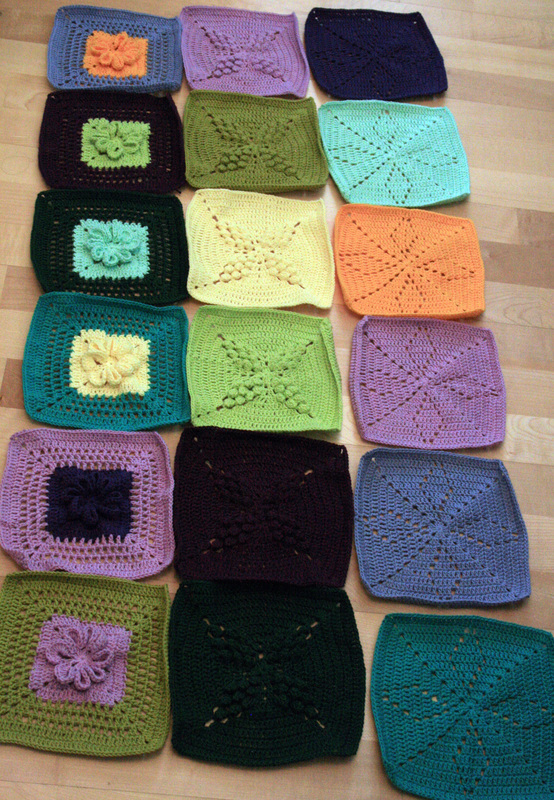 Well thanks to Mama H there were many more squares on their way to Best of Crochet. 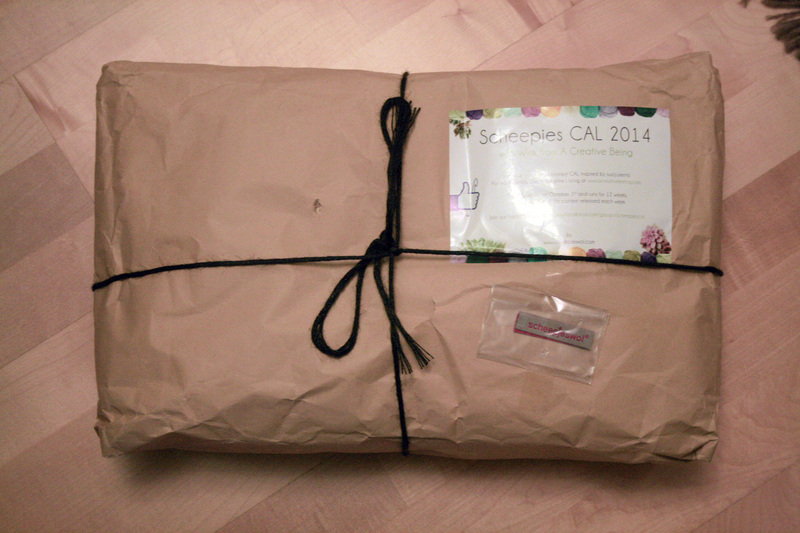 I got a phone call to say that she was going to join in but when the parcel arrived look how busy she was! 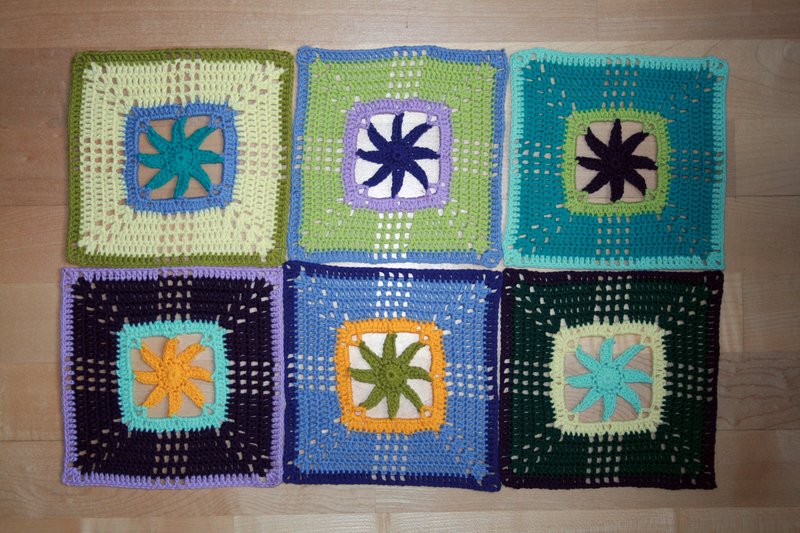 This really boosted our little stash so now I feel that we have made a good contribution that am pleased to report is winging it’s way to Best of Crochet to join up with all the other lovely squares that I have been reading about. 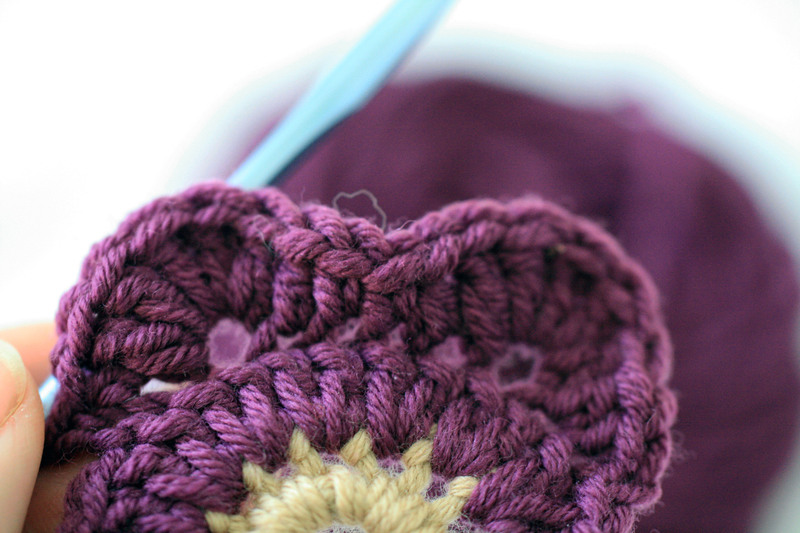 It has been quite hectic here at the Grange these last few weeks so regrettably crafting has taken a bit of a back seat. I am hoping to be back to it soon and have more to share with you all. 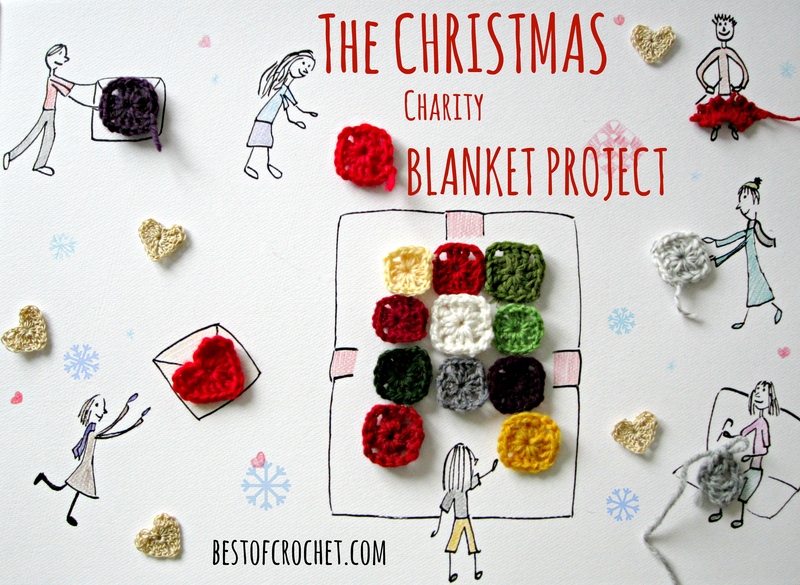 Found this great idea and wanted to share with you all as I know you too will want to join in and gift a few blanket squares to charitable causes. 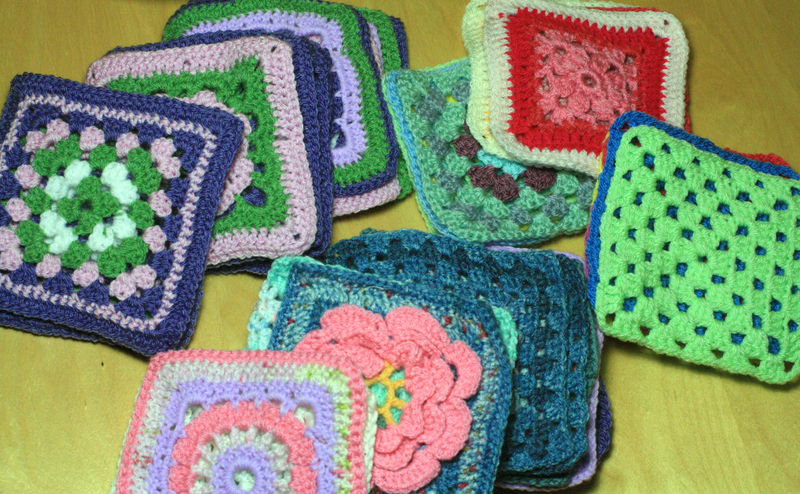 It is very brave of our fellow crafter to volunteer to join all the donated squares as we all know this can be the most trying part of blanket making! 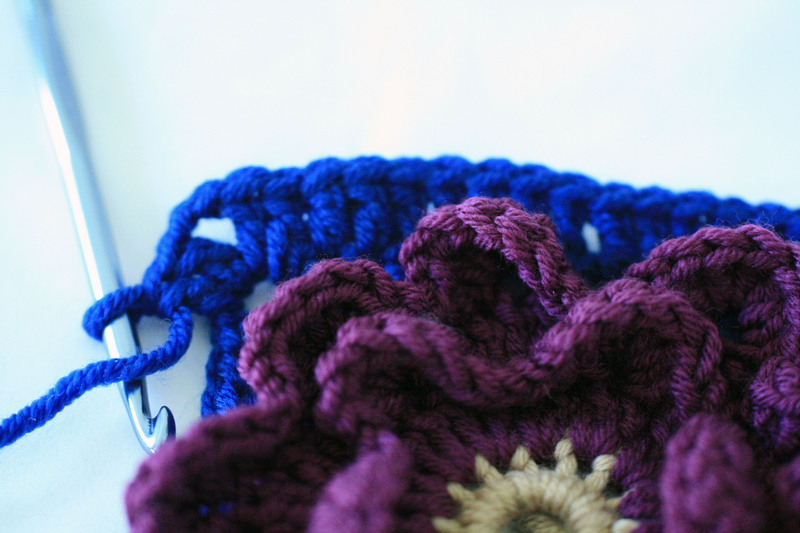 As soon as enough generous crafters pledge squares to make this a viable project the instructions will be published and we can all get going, I can just hear it now needles clacking and hooks a-hooking, it is after all the season of goodwill. To pledge your interest click on the link below and leave a comment. 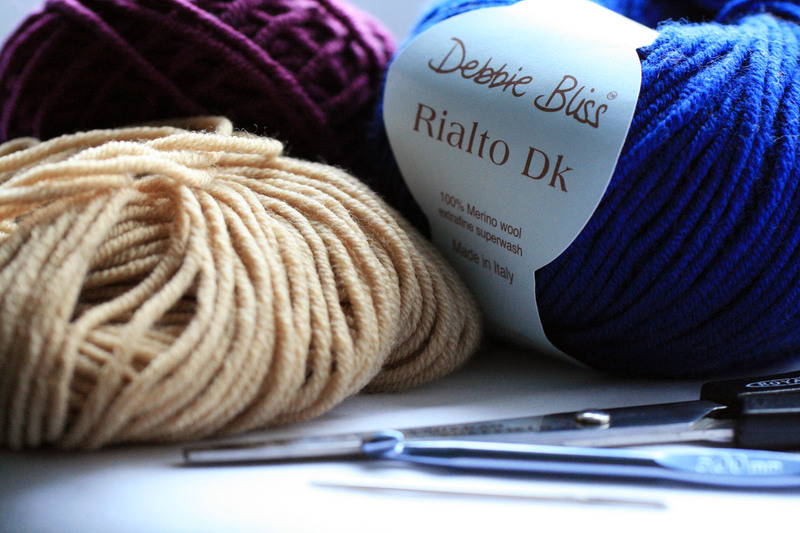 I have used Debbie Bliss Rialto Double Knit and a size 5 mm hook. 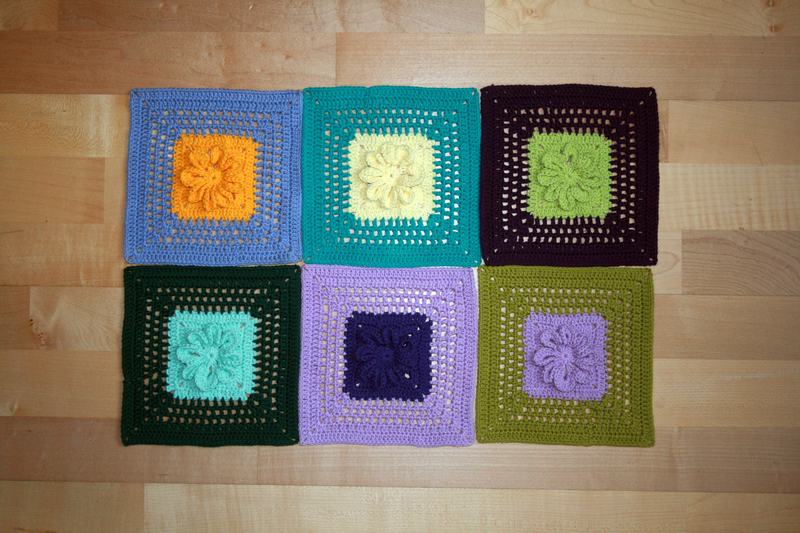 Size of the finished square using this yarn and hook size is 14 cm, 51/2 inches. 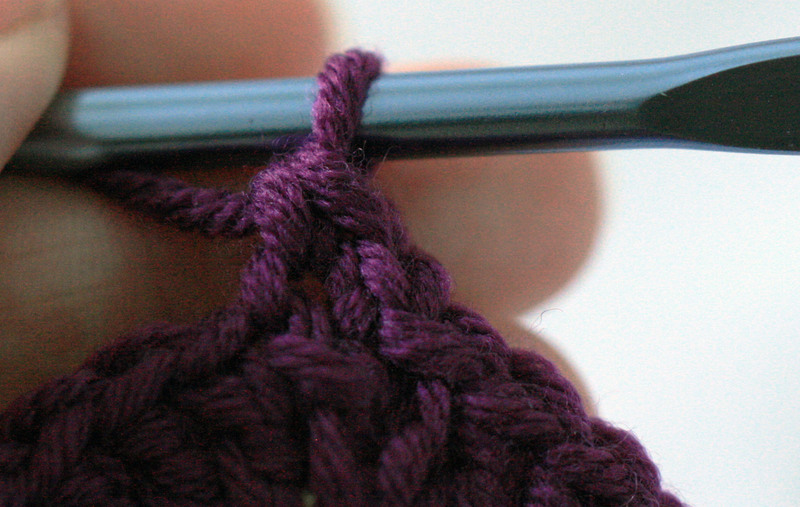 Slip stitch onto the centre of the ring. 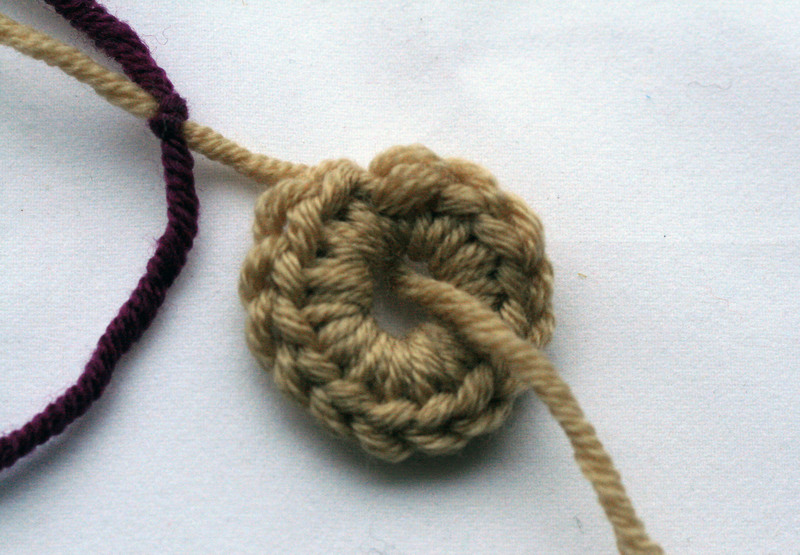 Work 15 double crochet into the centre of the ring. 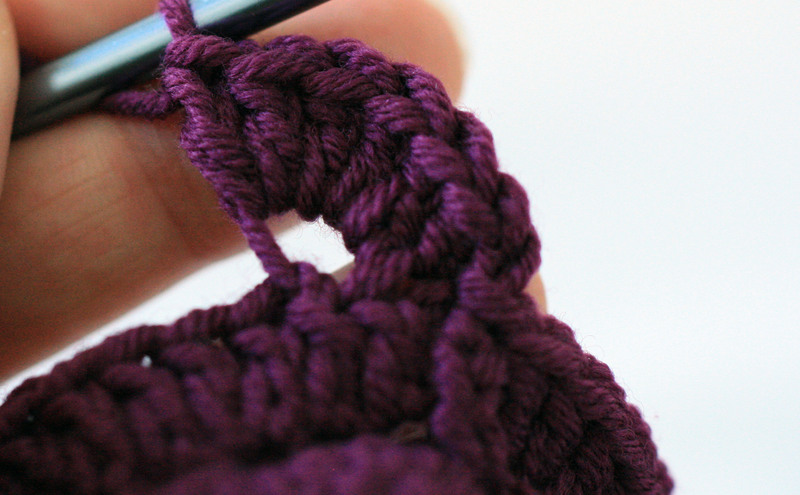 Slip stitch into the first double crochet. 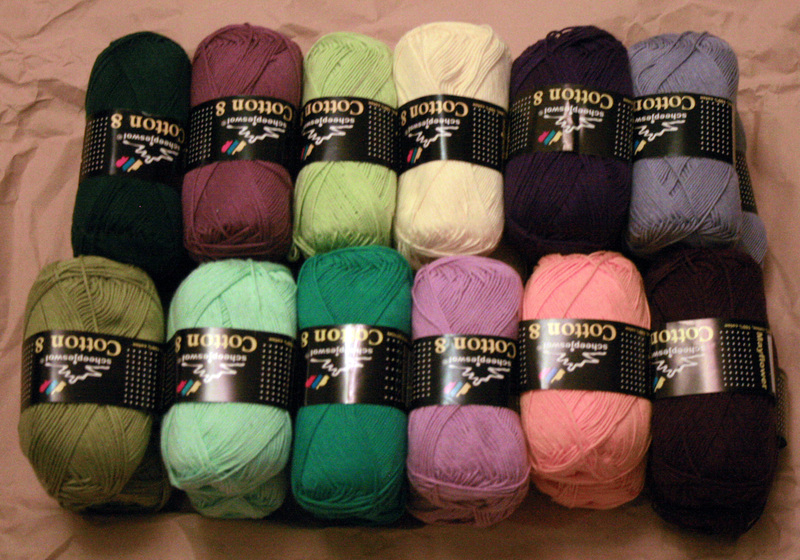 Cut yarn leaving approx. 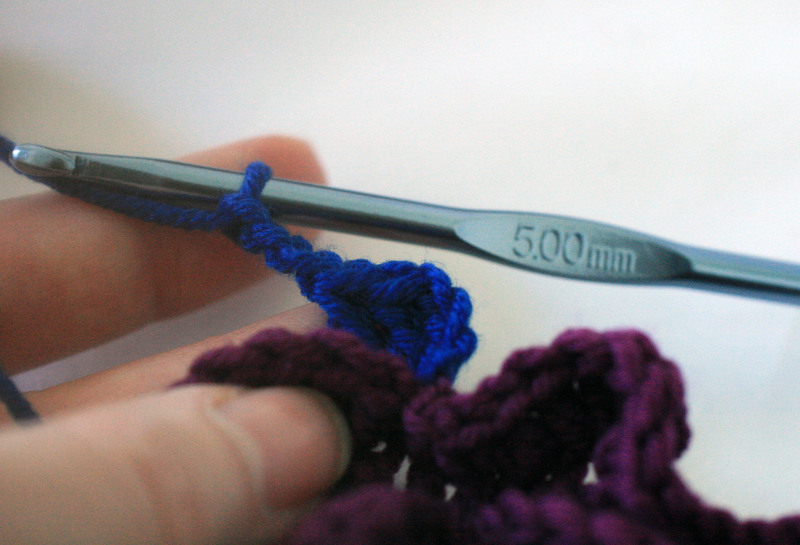 5 cm and draw through the loop to fasten off. 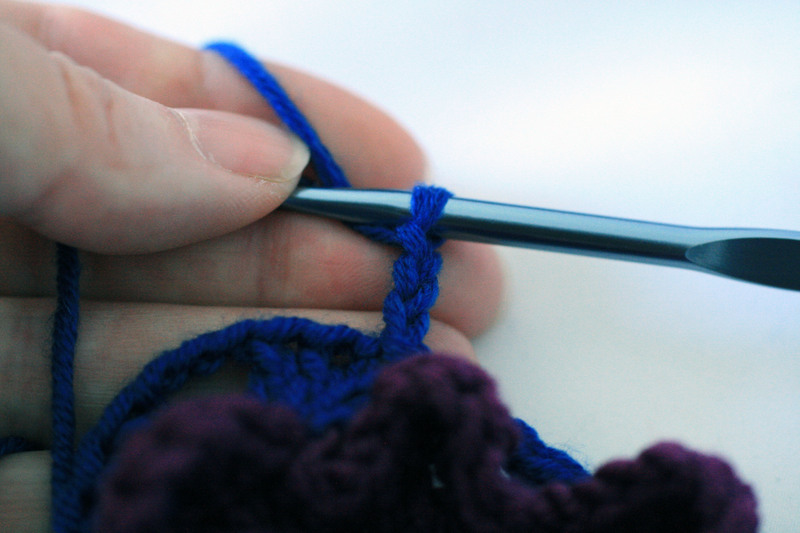 There are many different ways to join yarn but this is how I do it. 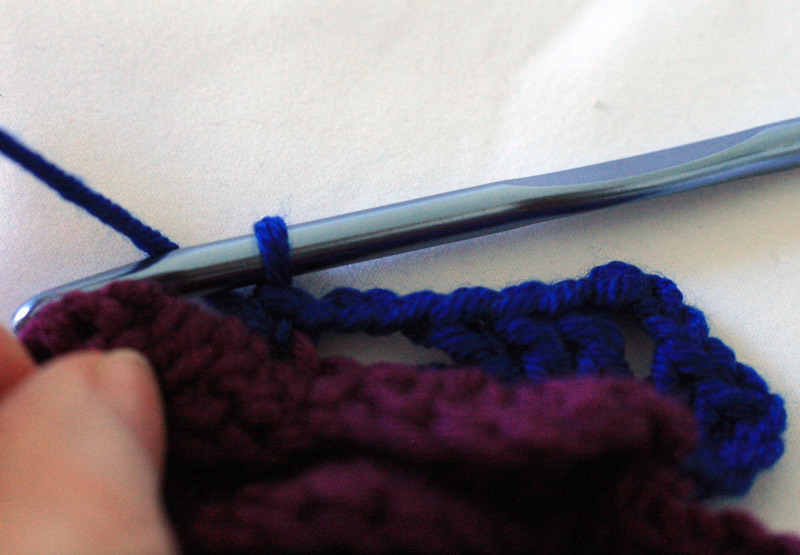 Tie the new colour to the finishing tail of the last yarn colour. Slide the knot down the tail and tighten so it sits snuggly against the last stitch. 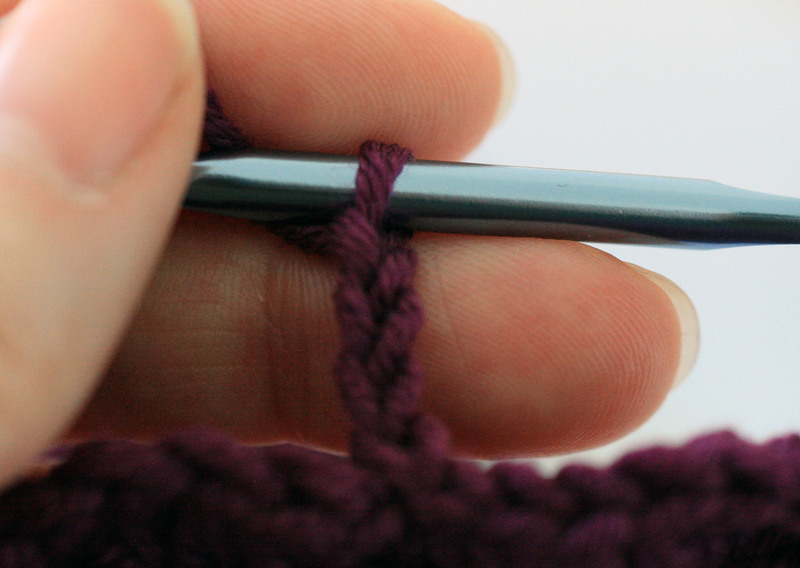 Pull the yarn through the top of the first double crochet of round 1. 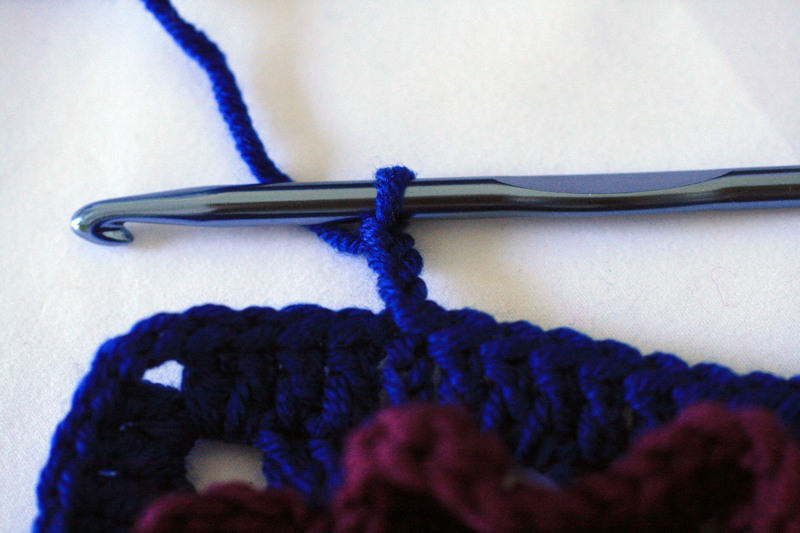 Chain 3 (counts as 1 treble), 1 treble crochet into the same space. 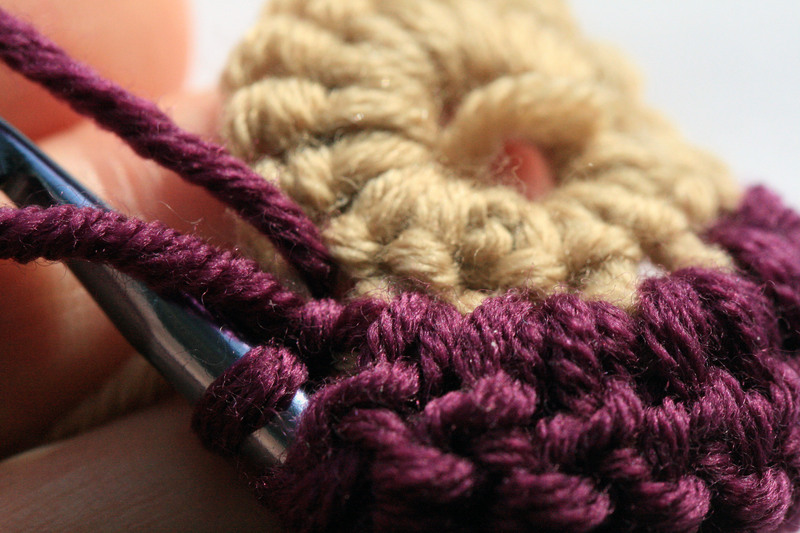 You can work in the tails as you crochet by holding them to the back of your work and enclosing them as you make each stitch. 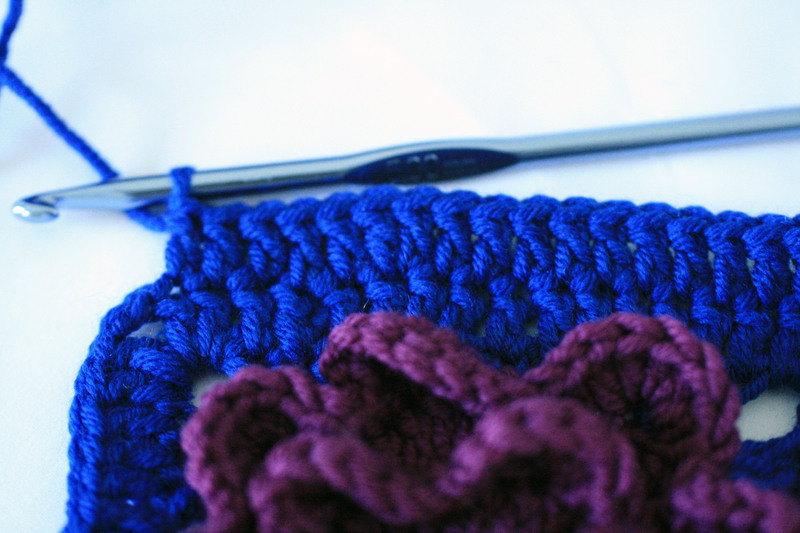 Work 2 trebles into each of the remaining 14 double crochet. 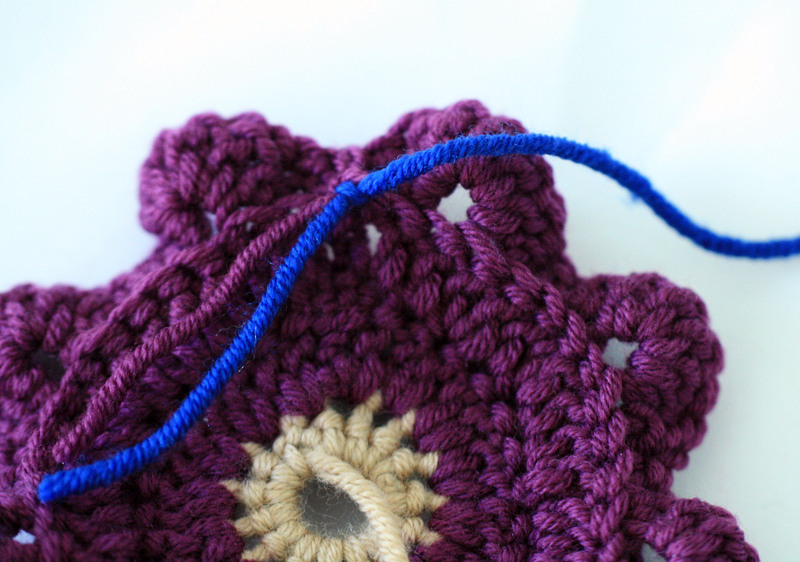 See how neatly the tails can be worked in as you go. 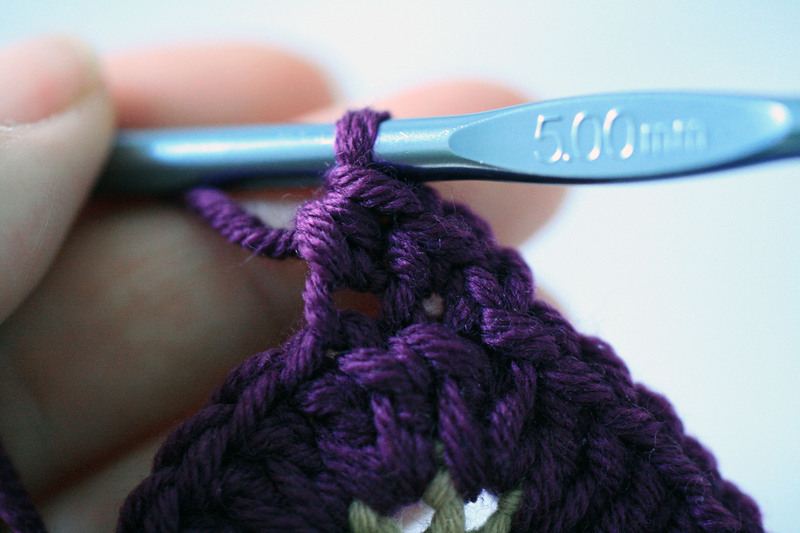 You now have 30 stitches. 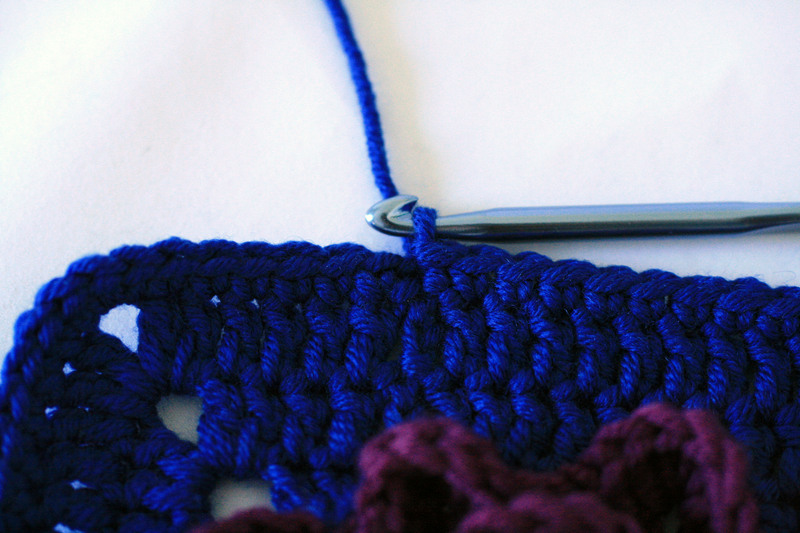 Slip stitch into the 3rd chain of the first 3 chain of this round. 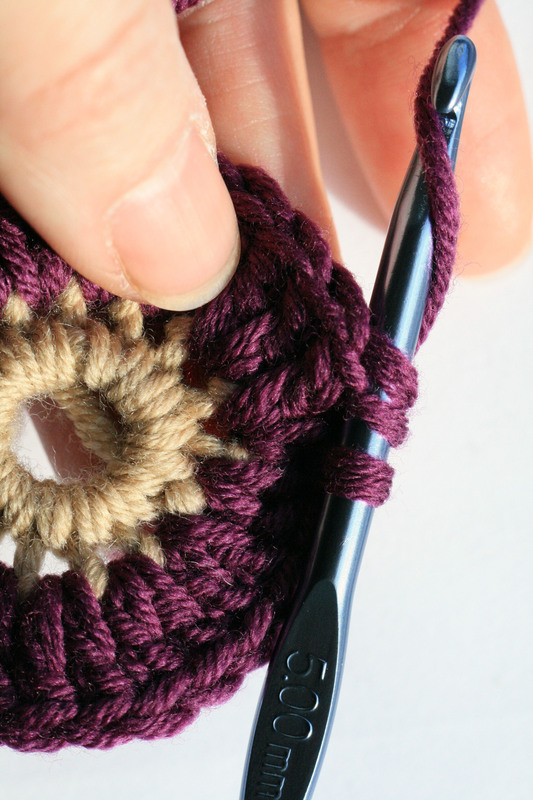 You will see there is only the starting tail showing as the tails from joining the new colour have been crocheted into the round. 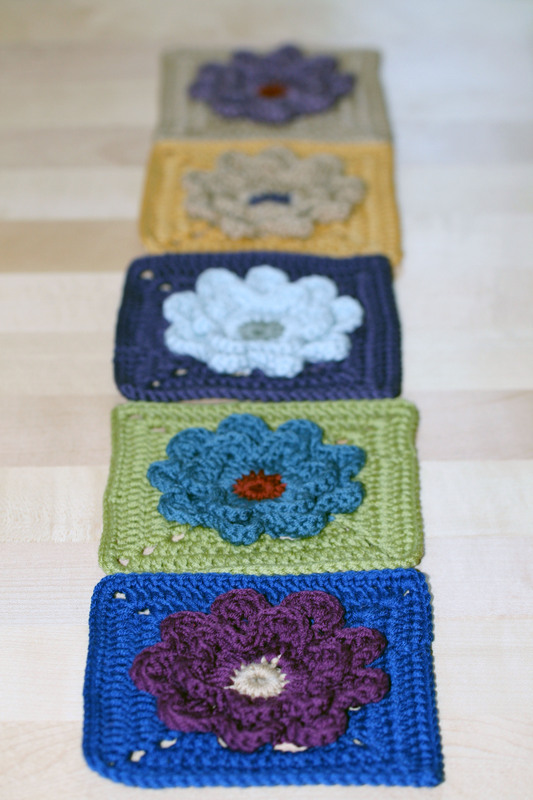 Now to start making the petals, we are only going to work into the front loop of each stitch. 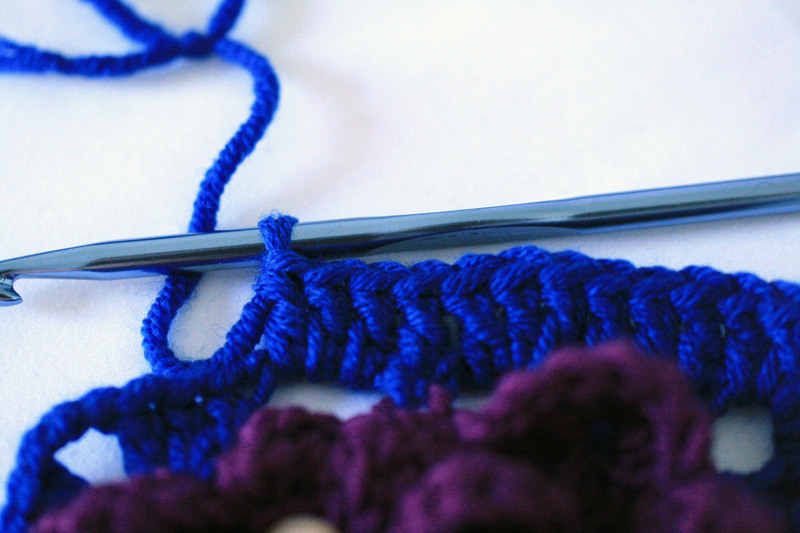 The back loop will be used for round 4. 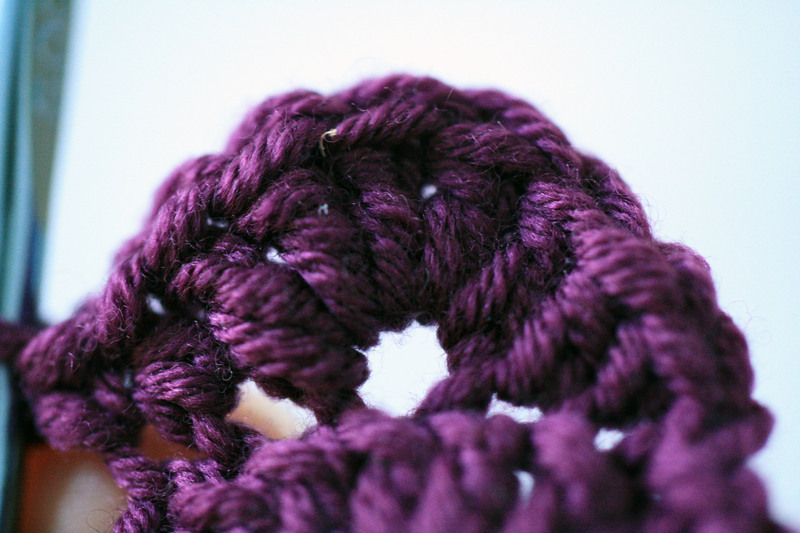 Chain 1 (counts as 1 double crochet). 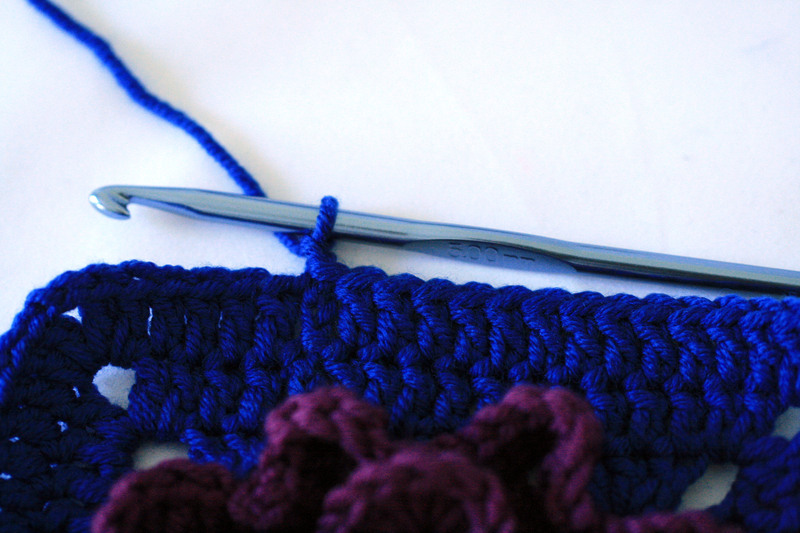 1 double crochet into the next stitch. 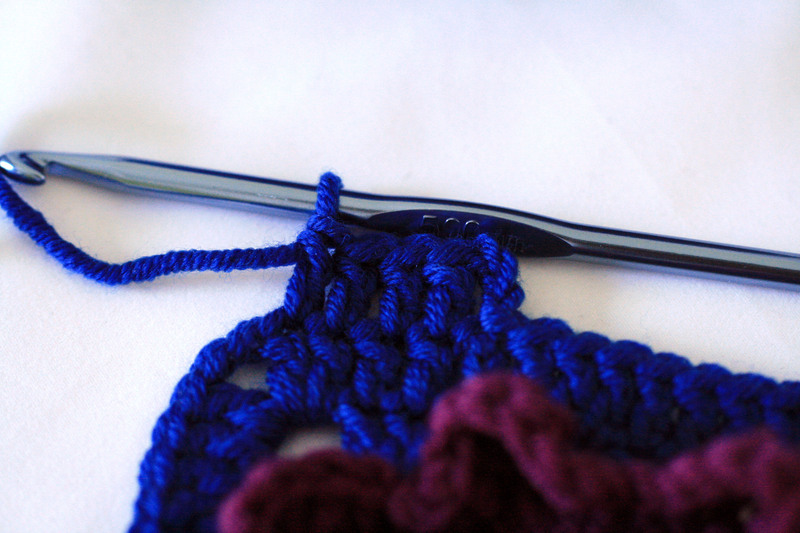 1 half treble into the next stitch. 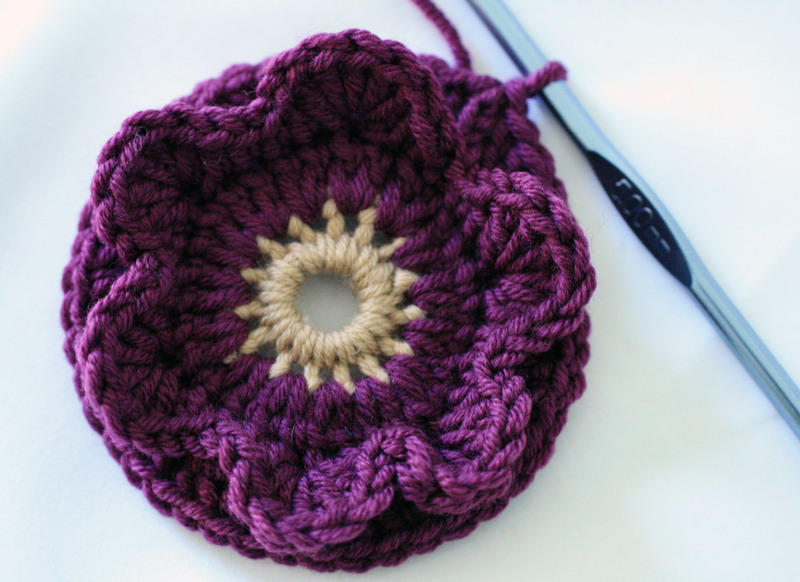 1 double crochet to complete the first petal. 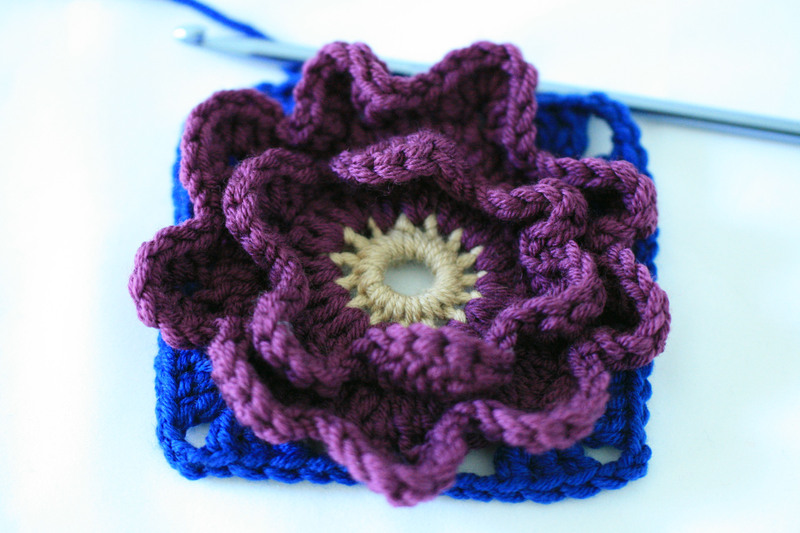 Continue working into the front loops only to make 4 more petals. 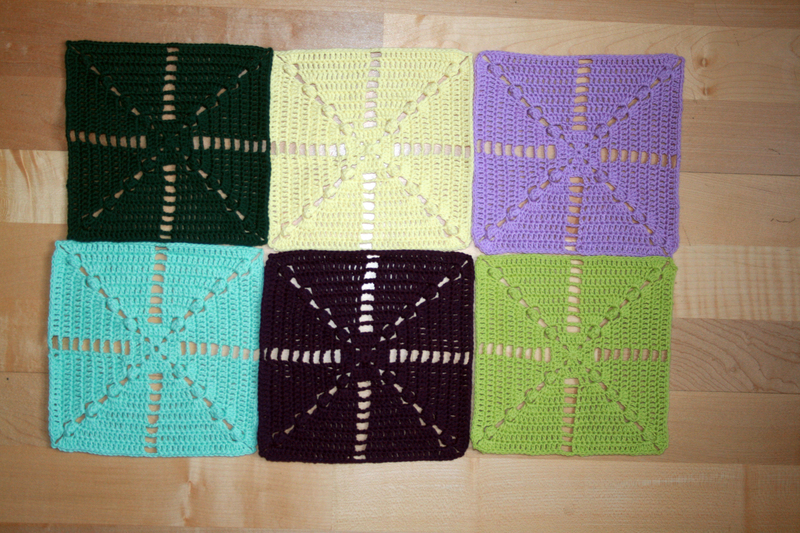 1 double crochet, 1 half treble, 5 trebles into the same stitch, 1 half treble, 1 double crochet. 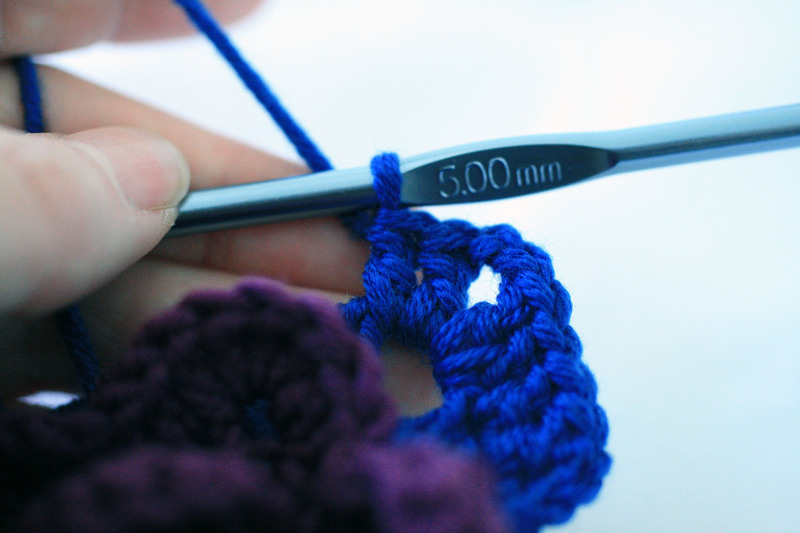 1 double crochet, 1 half treble, 5 trebles into the same stitch, 1 half treble, 1 double crochet, slip stitch into the chain made at the start of the round. 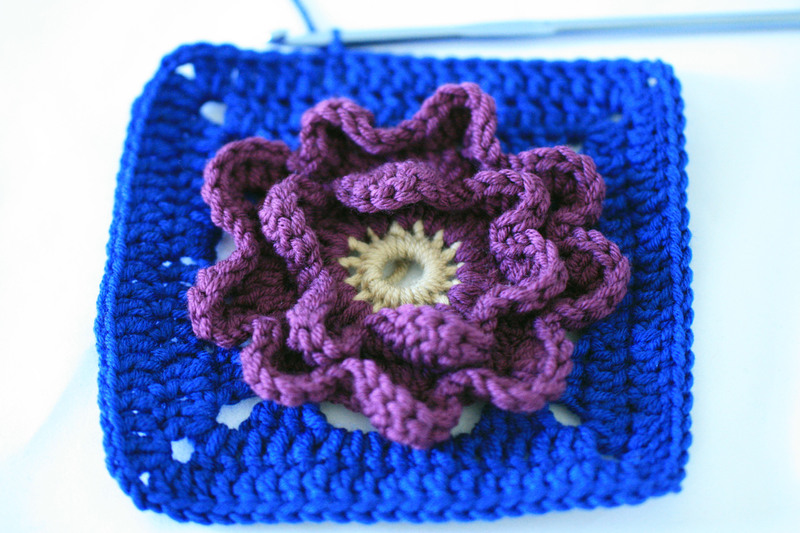 Now we will work into the back of the loop that you can see above on the back of the flower. 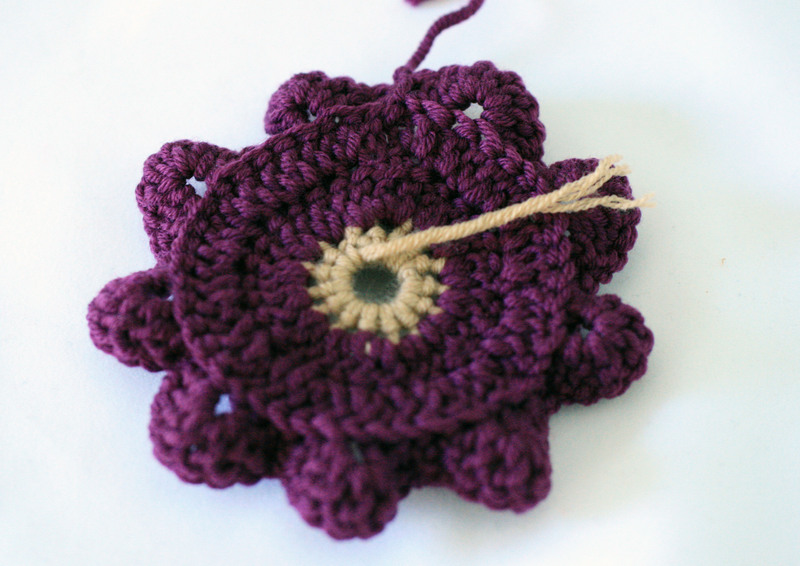 Start with the flower facing you and slip stitch into the loop immediately below. Chain 3 (counts as 1 treble). 1 treble into the same loop. 1 treble into the next loop. 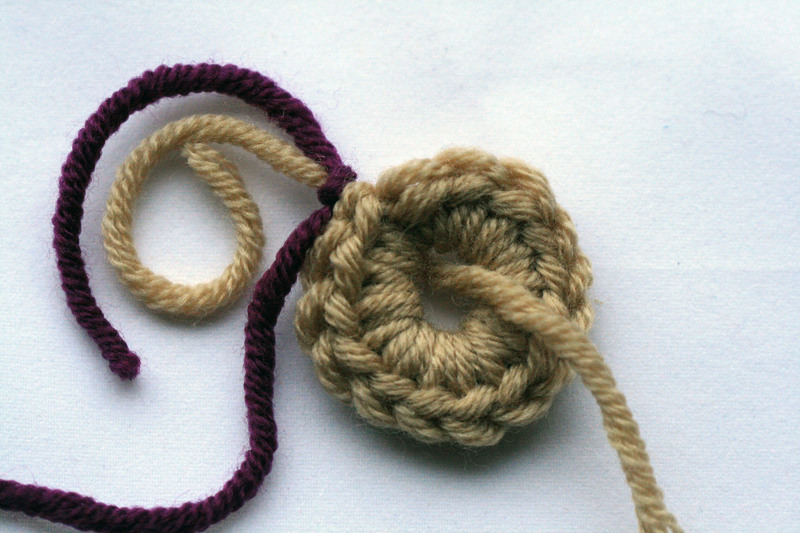 Continue the round alternately working 2 trebles then 1 treble into each loop. 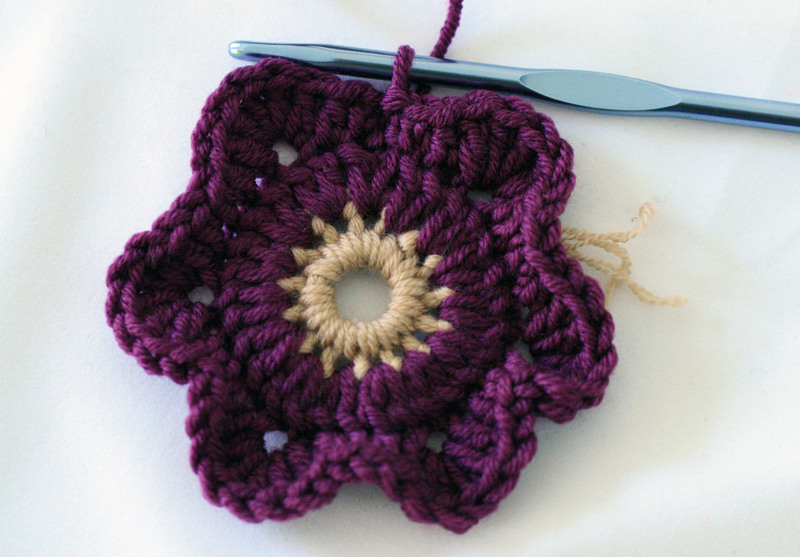 You will have 45 stitches, have a quick count to check as you will not be able to complete the next round of petals without the correct number of stitches. 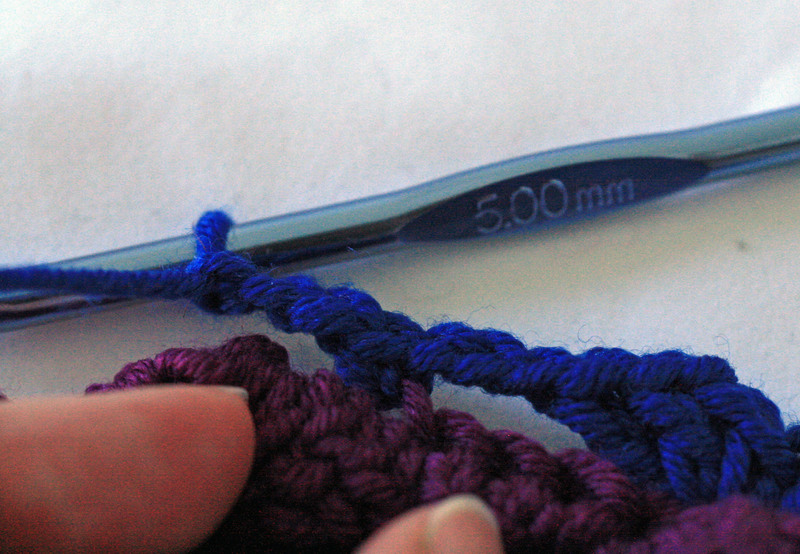 Slip stitch into the 3rd chain of the 3 chain worked at the start of the round. 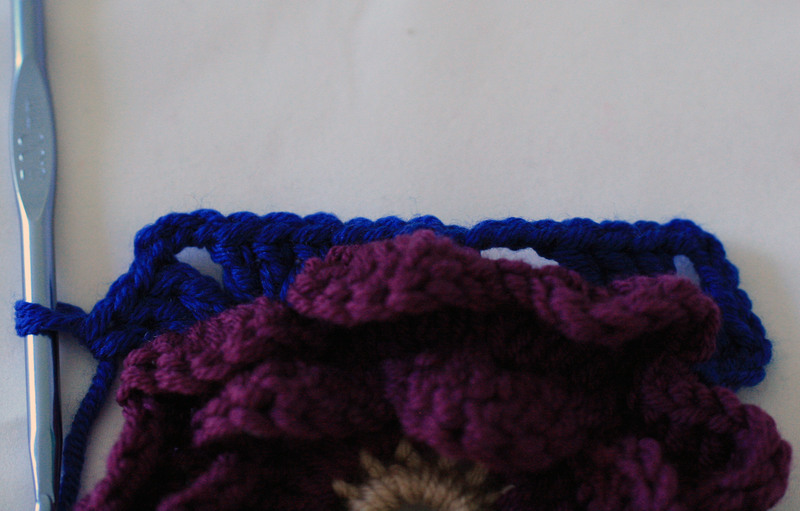 Again we are only going to work into the front loop of each stitch for this second round of petals. 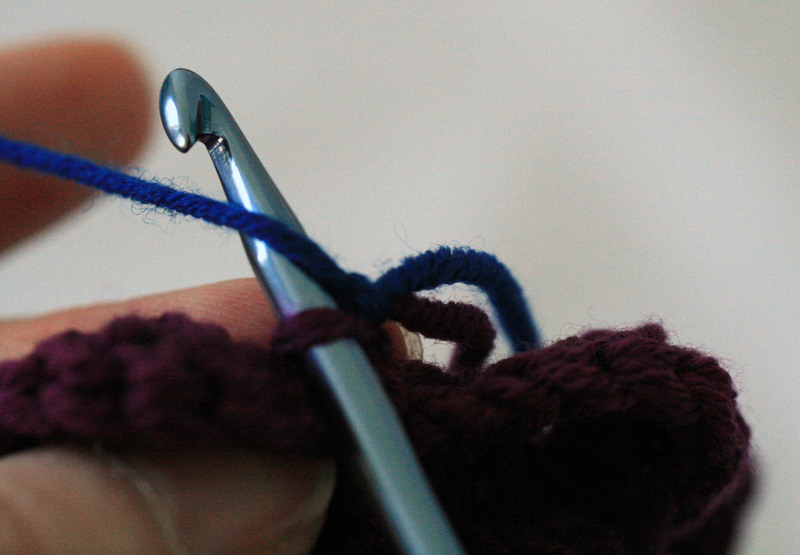 The back loop will be used for round 6. 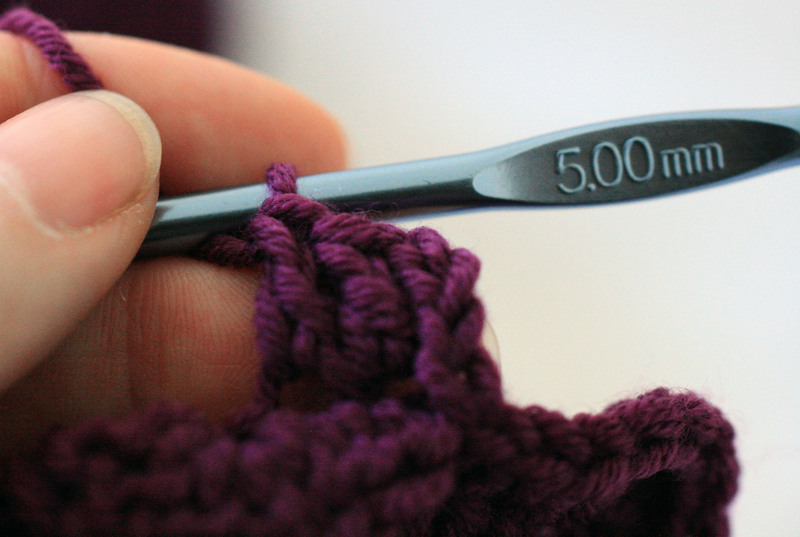 5 trebles into the next stitch. 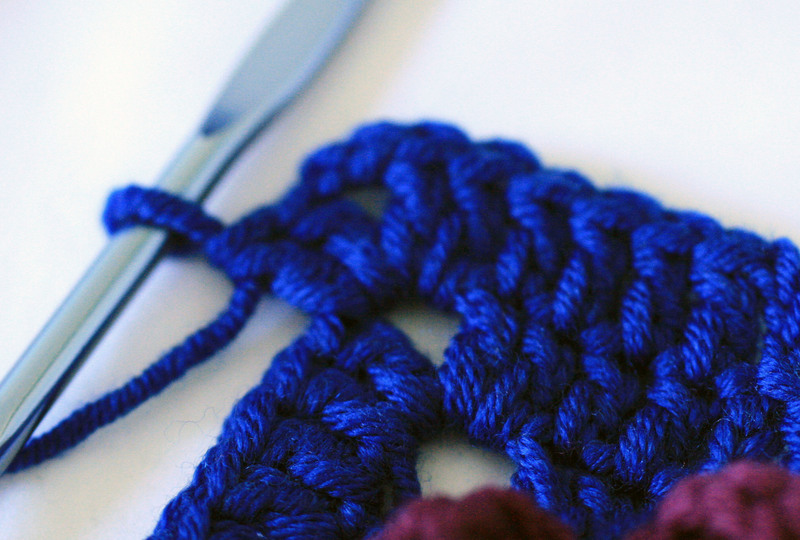 1 double crochet, 1 half treble, 5 trebles into the same stitch, 1 half treble, slip stitch into the chain made at the start of the round. 9 petals. 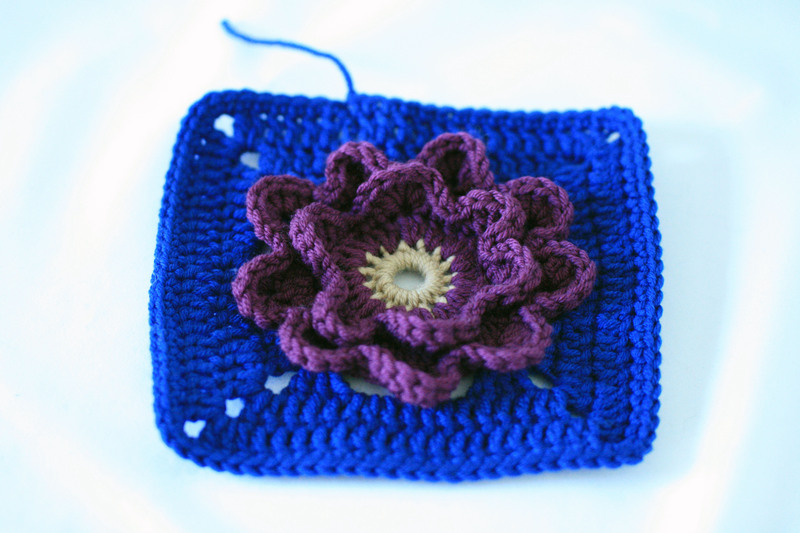 With the flower facing you and slip stitch into the loop immediately below. 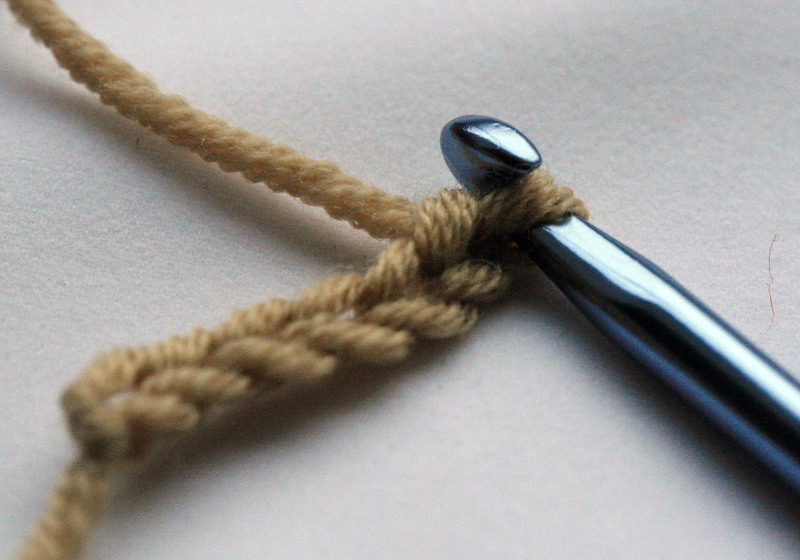 Join the next colour by tying a knot around the tail threaded through the loop. 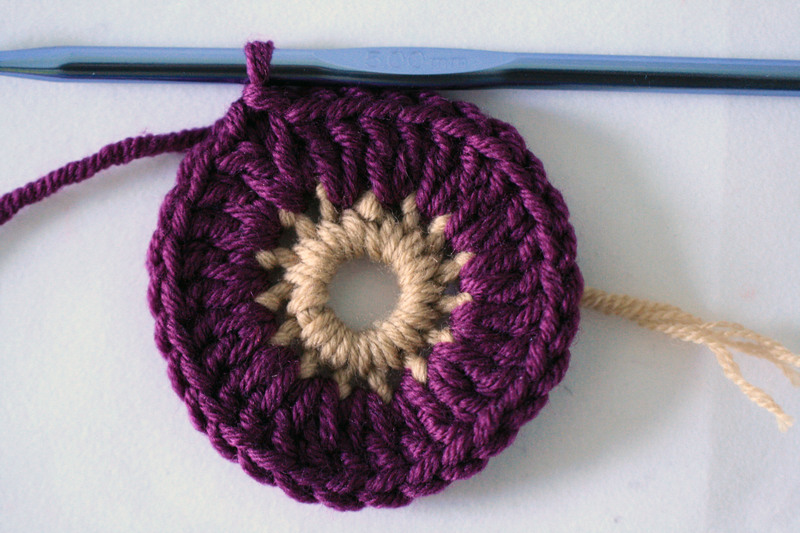 Turn the flower around to face you, hold the top petals down and draw the yarn through the loop. 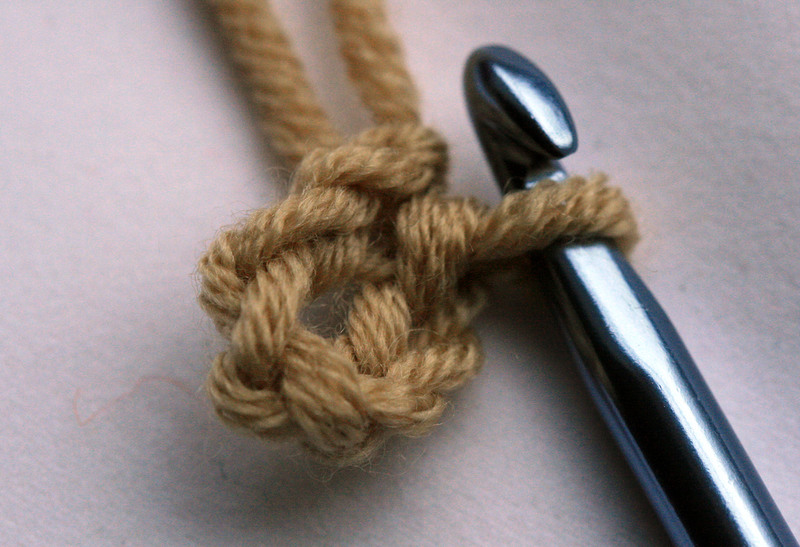 Treble 2 into the same loop. 3 trebles into the next loop. Count along to the 5th loop from the last loop worked. 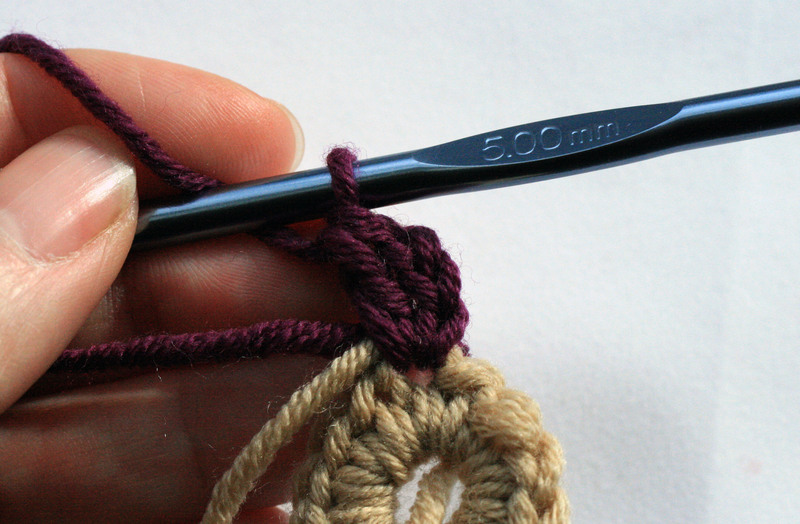 Work 1 double crochet into the 5th loop. 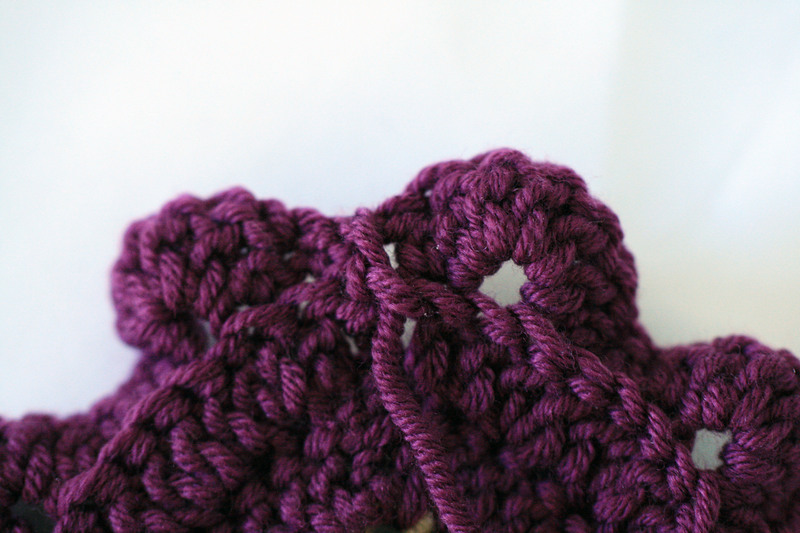 Count along to the 5th loop from the double crochet loop worked. Work 3 trebles into the 5th loop. 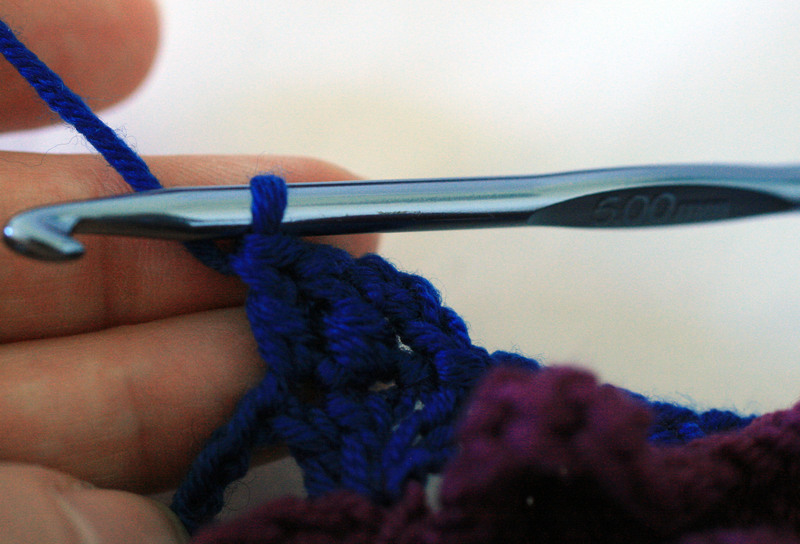 Work 3 trebles into the next loop to form the second corner. Continue the round as follows. 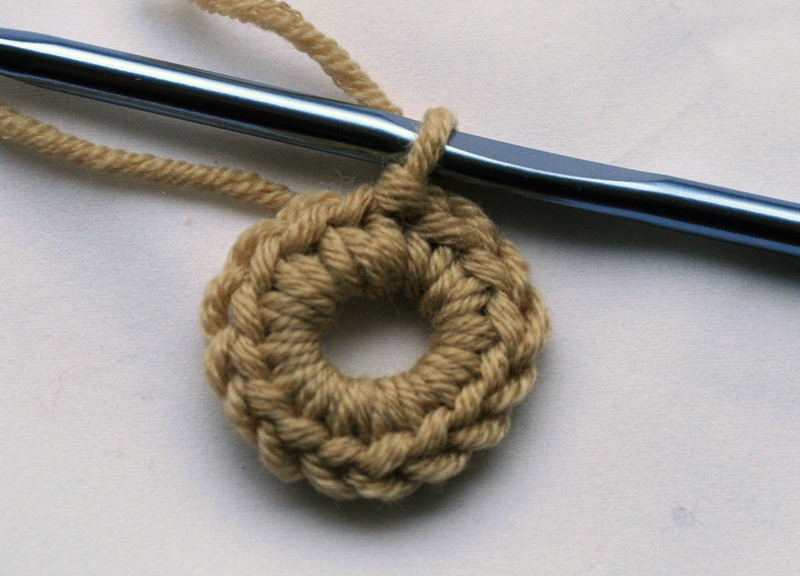 Count along to the 5th loop from last three treble worked. 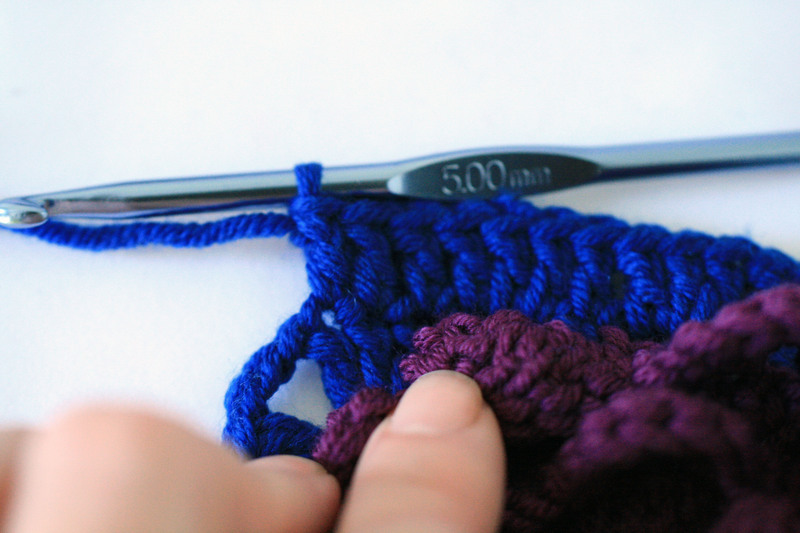 Work 1 double crochet into the 5th loop. 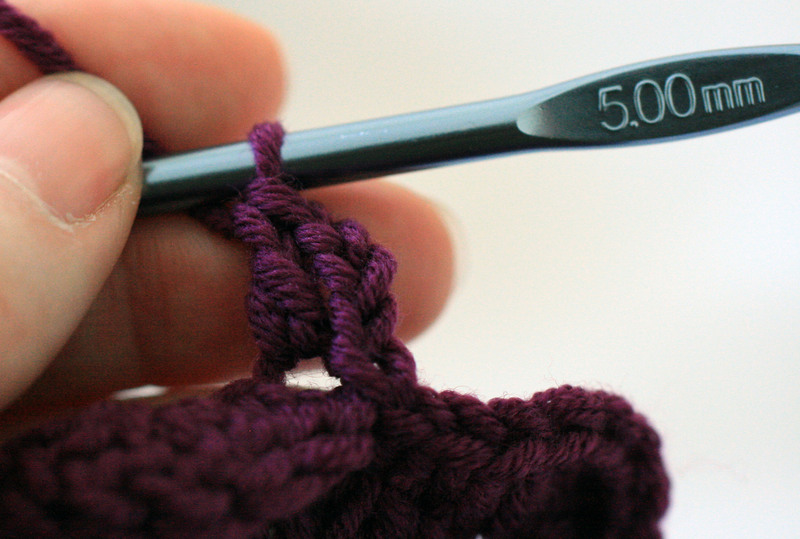 Count along to the 5th loop from the double crochet. Work 3 trebles into the 5th loop. Count along to the 5th loop from the last 3 trebles worked. 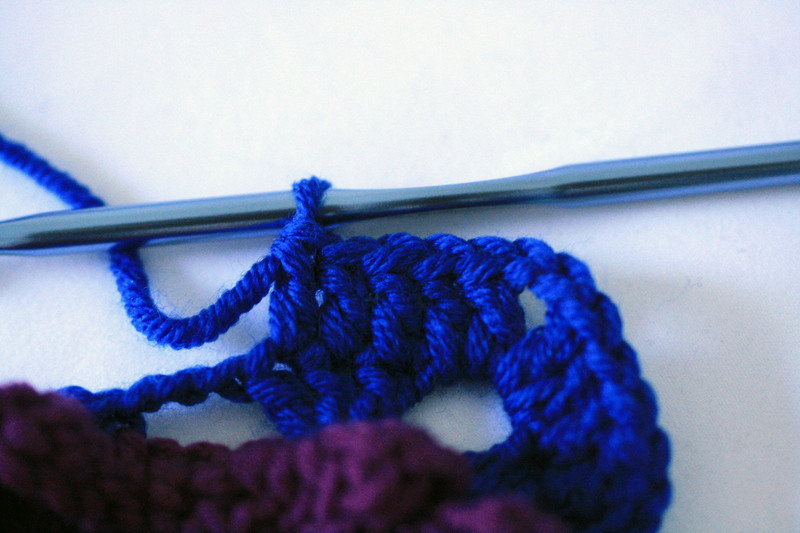 Work 1 double crochet into the 5th loop. 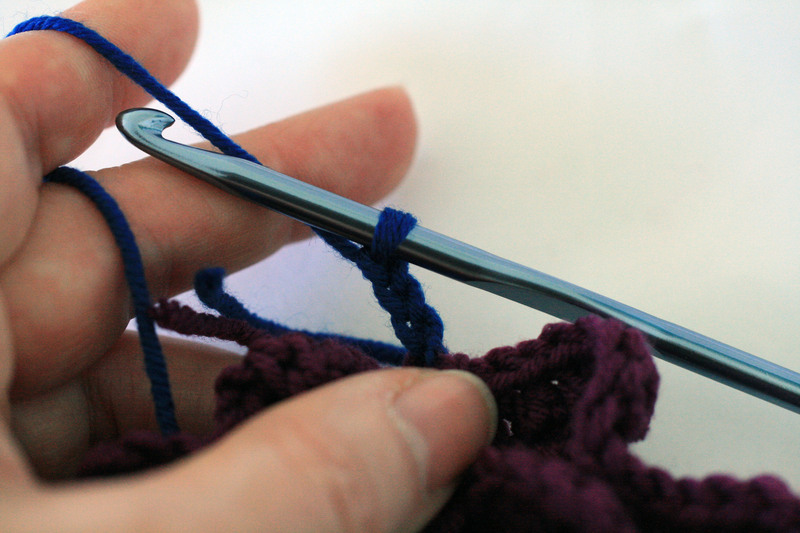 Work 3 trebles into the next loop to form the fourth corner. 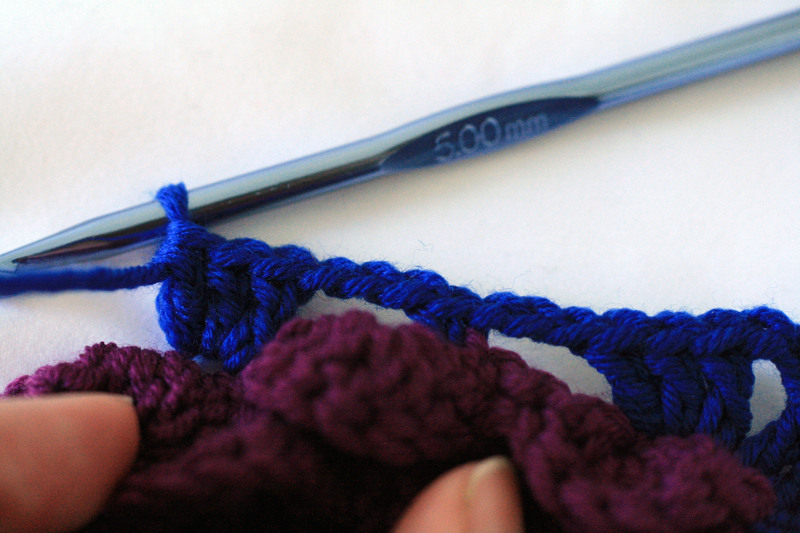 Slip stitch into the third chain of the first 3 chain worked at the start of round 6. Work 3 chain (counts as first treble). Work 1 treble into each of the next 2 trebles. 2 trebles 2 chain 2 trebles into the corner space. Work 1 treble into each of the next 3 trebles. 3 trebles into the next chain space. 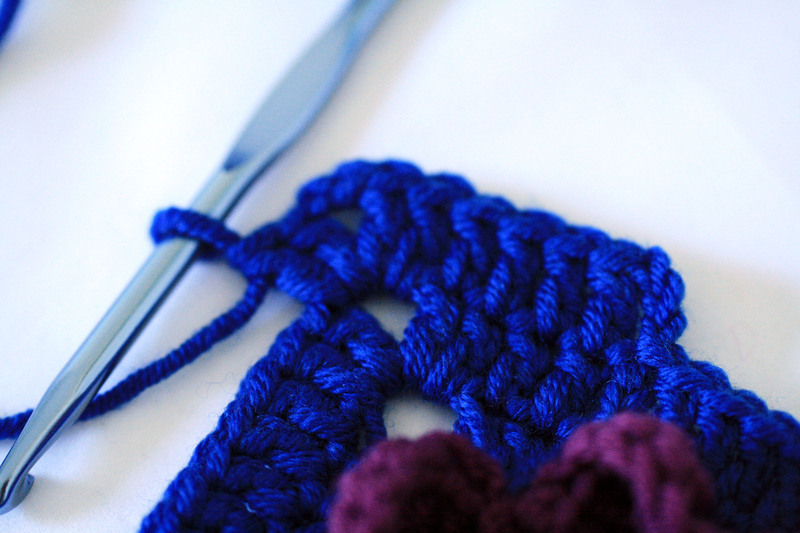 1 treble into the double crochet. 3 trebles into the next 3 chain space. 1 treble into each of the next three trebles. Work 2 trebles, 2 chain, 2 trebles into the corner space. *1 treble into each of the next three trebles. Repeat from * to * 1 more time. 3 trebles into the next three trebles. 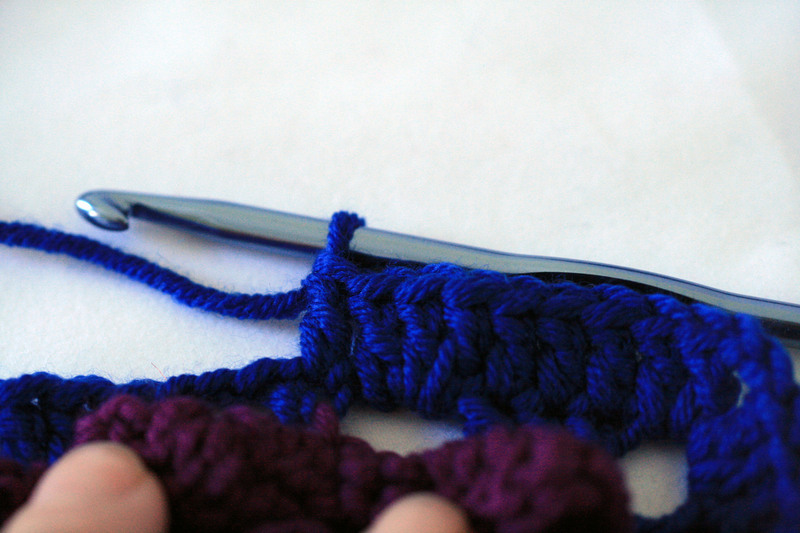 Slip stitch into the 3rd chain of the first 3 chain worked at the start of this round. *1 treble into each of the next 4 trebles. 2 trebles, 2 chain, 2 trebles into the corner space. Continue along to the next corner working 1 treble into each treble. 17 trebles. Continue round 8 working *17 trebles, 1 into each treble, and 2 trebles 2 chain 2 trebles into the corner space* twice. 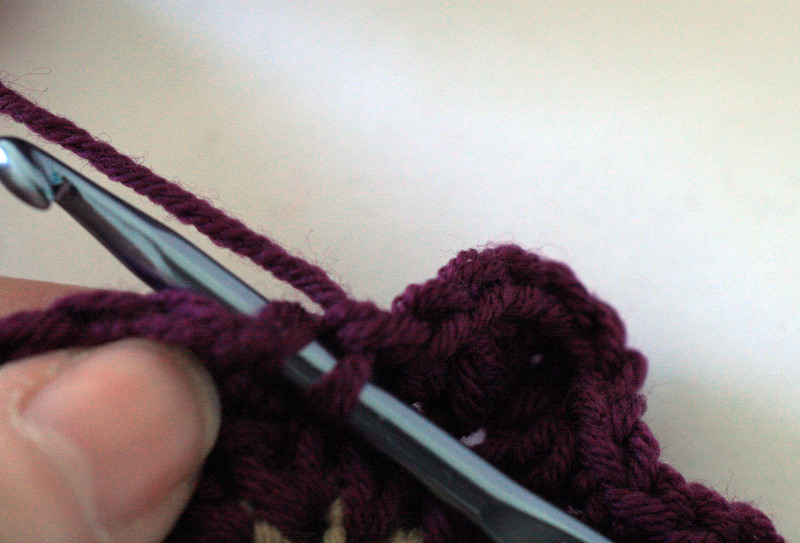 Work 12 trebles ending with a slip stitch into the 3rd chain of the 3 chain at the start of the round. 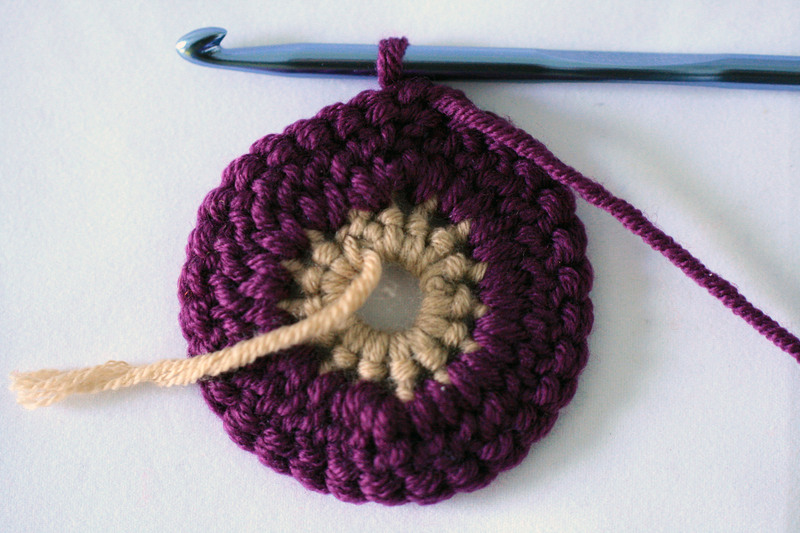 Continue round 9 working 1 double crochet into each of the next 6 trebles, 4 double crochet into corner space. 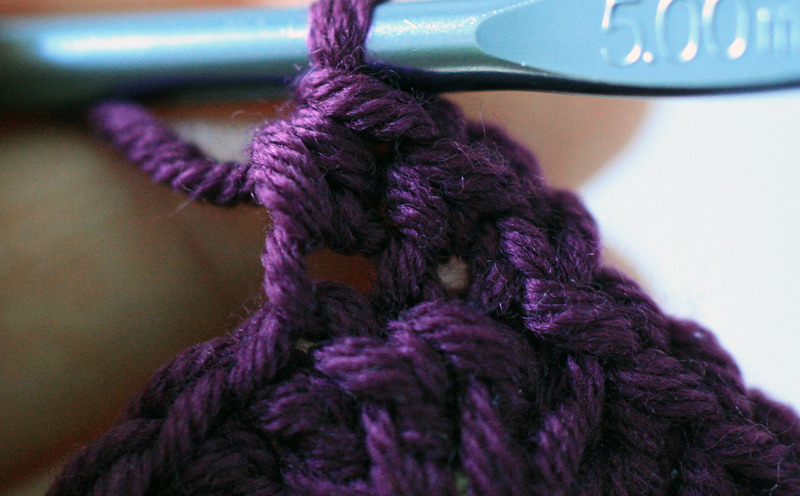 *Work 1 double crochet into the next 21 trebles. 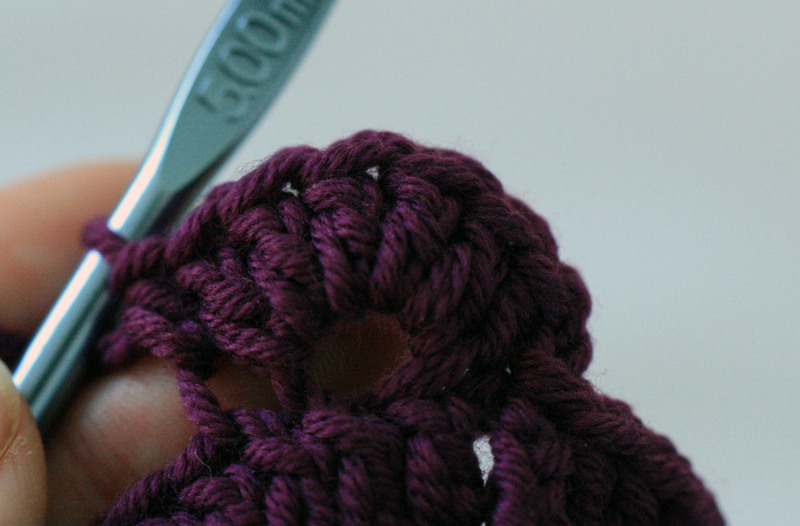 4 double crochet into corner space. * three times. 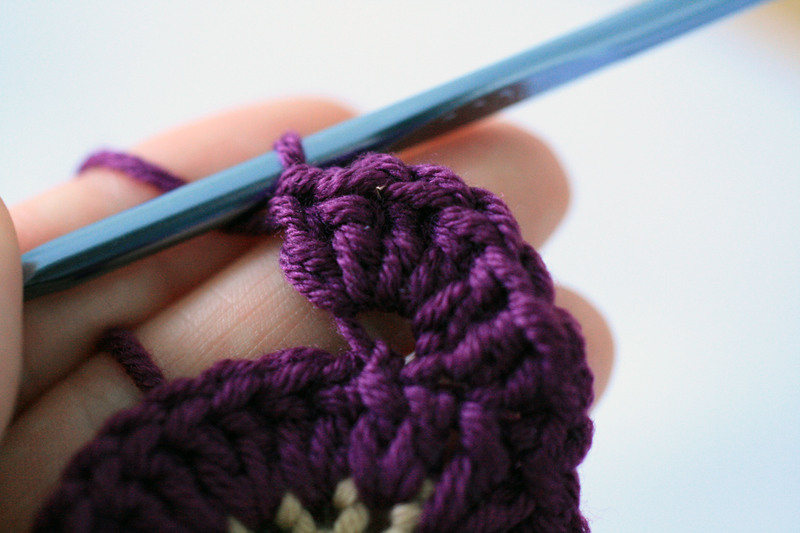 double crochet into the next 14 trebles. 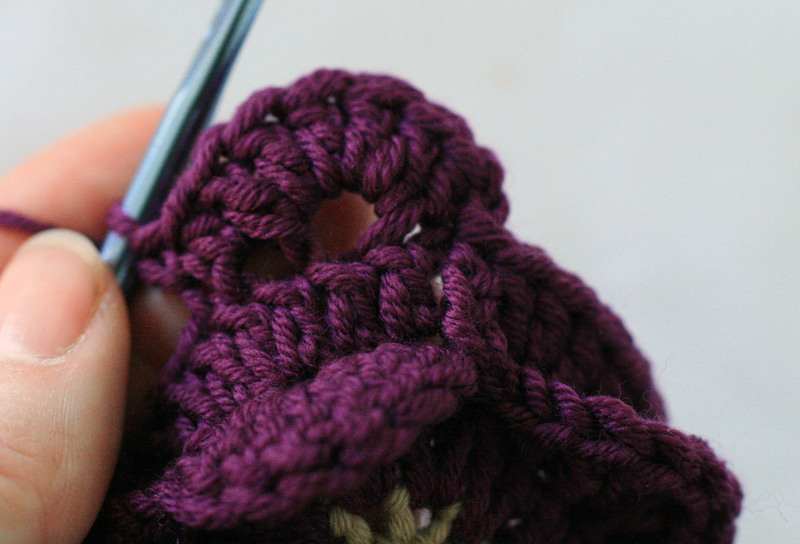 End with a slip stitch into the chain made at the start of the round. 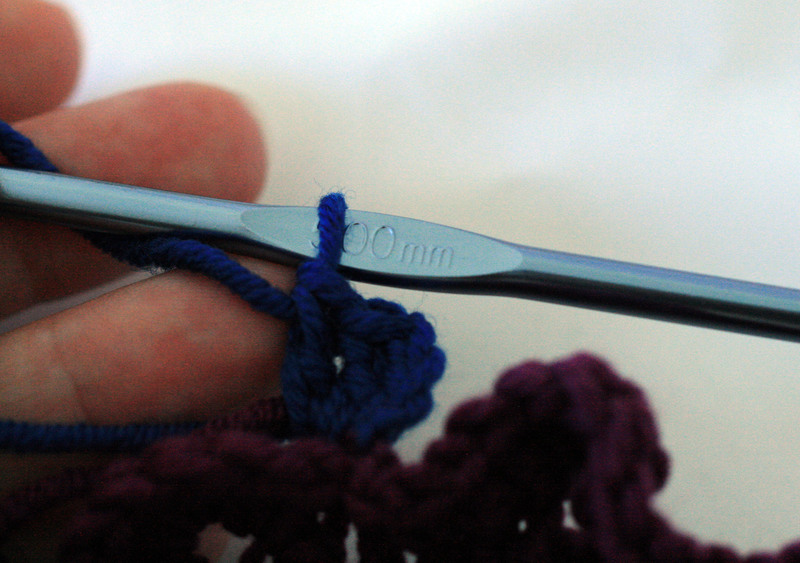 Cut your yarn leaving a 3 inch tail, pull the tail through the last loop and pull to tighten the knot. 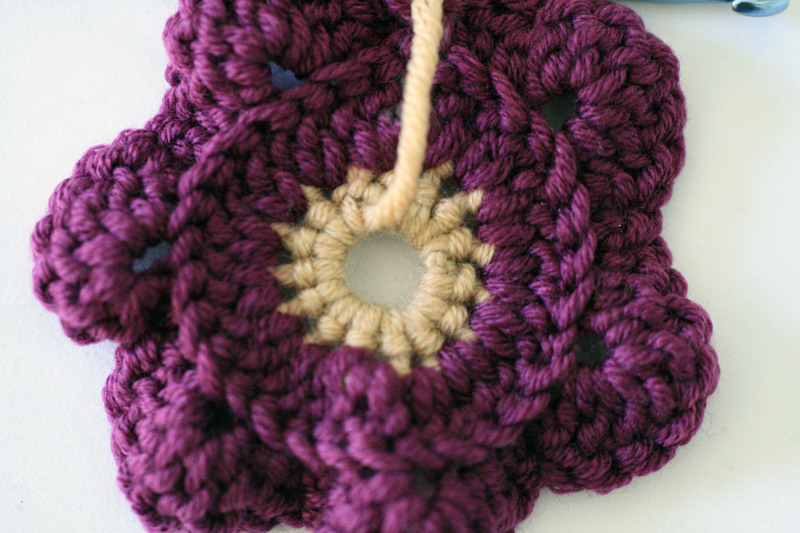 Next you need to sew in any of the ends that you have not managed to crochet into your square. 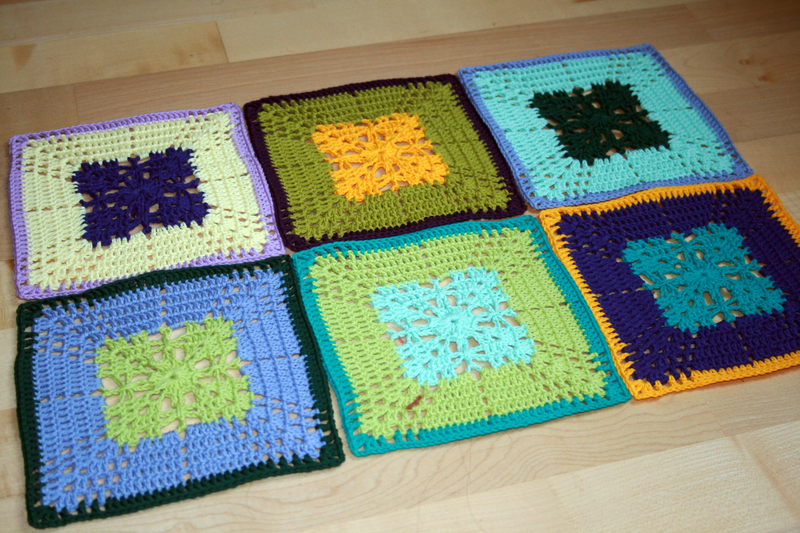 It looks a bit out of alignment for a square at the moment but I always like to pin out each square on the ironing board or other flat surface and either lightly steam and leave to dry or lightly spray with a water mist and leave to dry naturally. 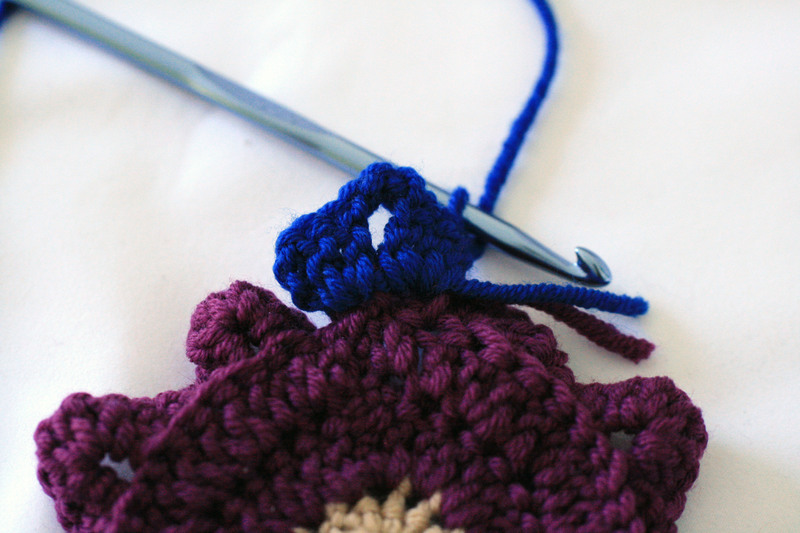 This sets your square so make sure you pin out the corners neatly. 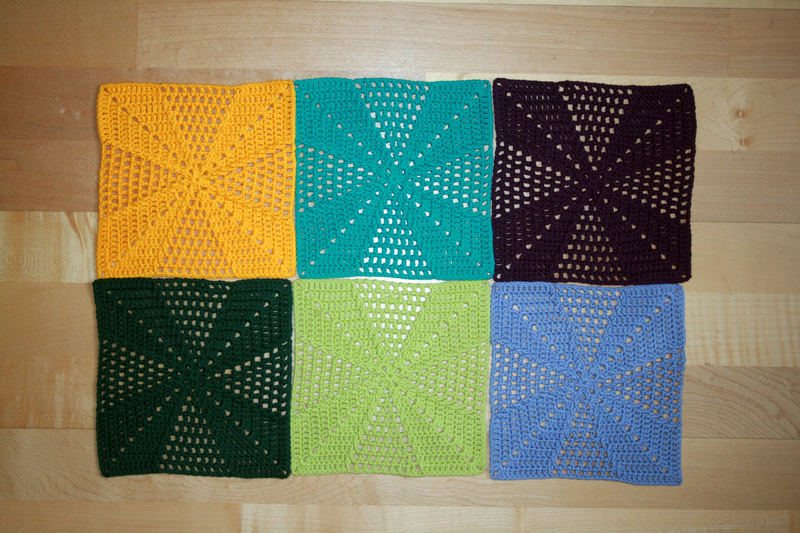 Now you can make other colour combinations and make into a cushion or blanket. If you have an questions please do not hesitate to let me know and I will be happy to help if I can. 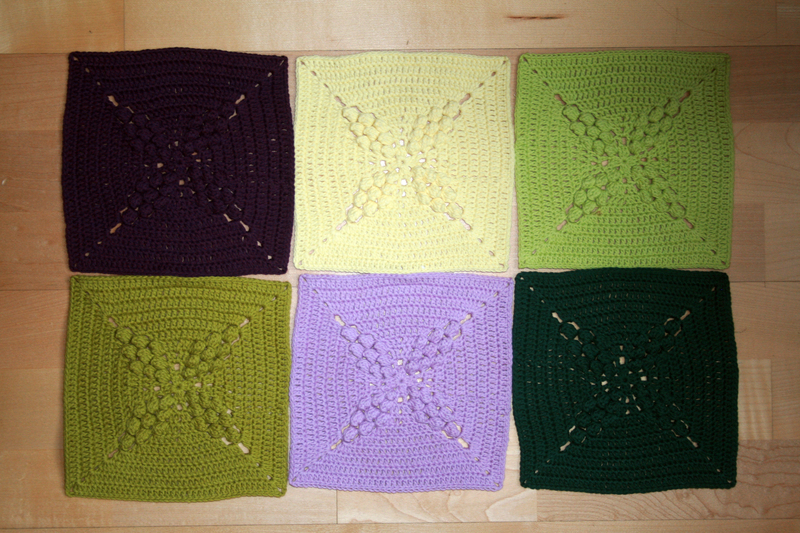 I would also love to see any photos of your squares. 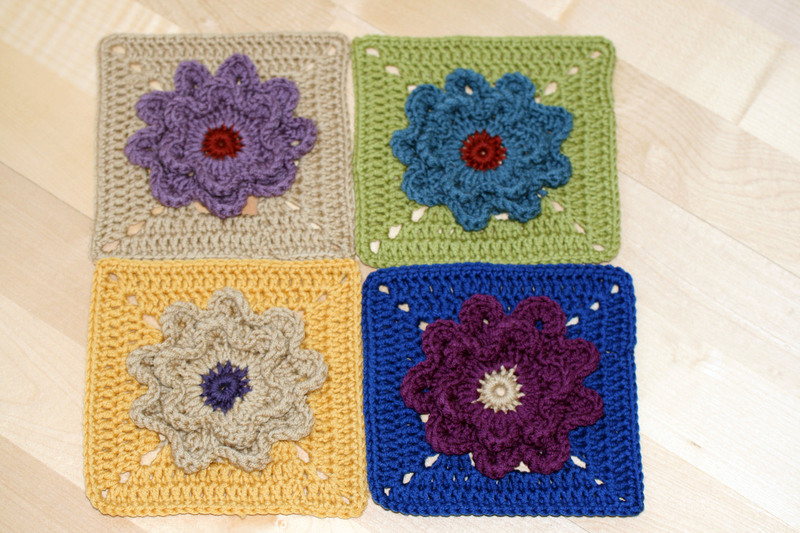 The idea for the flower pattern blanket square came from making this lovely blooming flower cushion which I have made a couple of times now for my wonderful girls. 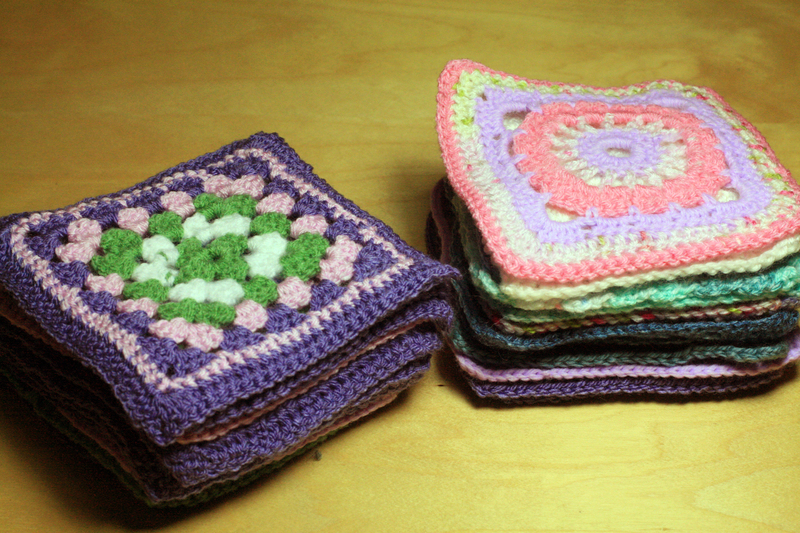 I absolutely love it and wanted to incorporate the flower pattern into their blankets that I have made. 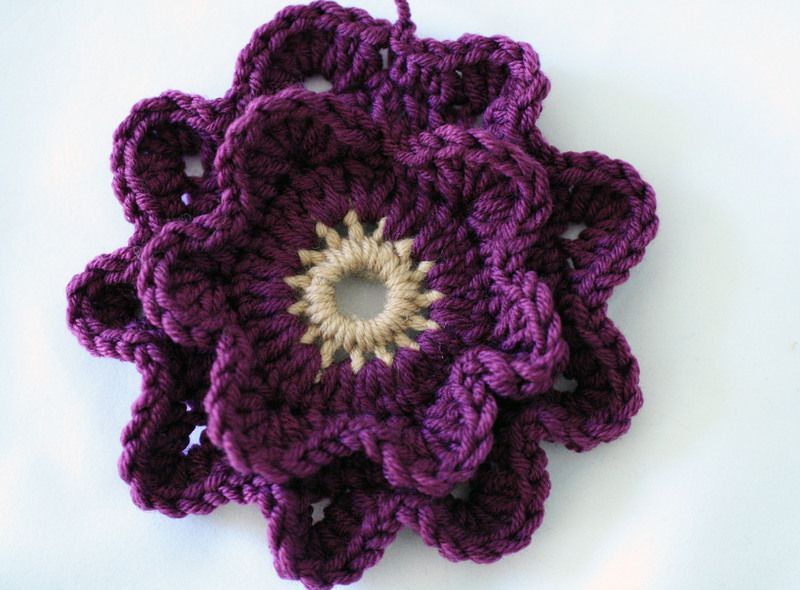 Pattern by Attic 24 blooming flower cushion.